Organisms adapt to environmental cues using diverse signaling networks. In order to sense and integrate light for regulating various biological functions, photoreceptor proteins have evolved in a modular way. This modularity is targeted in the development of optogenetic tools enabling the control of cellular events with high spatiotemporal precision. However, the limited understanding of signaling mechanisms impedes the rational design of innovative photoreceptor-effector couples. Here, we reveal molecular details of signal transduction in phytochrome-regulated diguanylyl cyclases. Asymmetric structural changes of the full-length homodimer result in a functional heterodimer featuring two different photoactivation states. Structural changes around the cofactors result in a quasi-translational rearrangement of the distant coiled-coil sensor-effector linker. Eventually, this regulates enzymatic activity by modulating the dimer interface of the output domains. Considering the importance of phytochrome heterodimerization in plant signaling, our mechanistic details of asymmetric photoactivation in a bacterial system reveal novel aspects of the evolutionary adaptation of phytochromes. While symmetry is a recurring feature of life on earth, many processes in biology deviate from this general trend. Starting from the selection of specific building blocks for biological systems, that is L-amino acids and D-sugars for proteins and nucleic acids, respectively, asymmetry has impacted living organisms ever since the origin of life. The importance of asymmetric processes ranges from the regulation of enzymes (Kim et al., 2017) and signaling processes (Sysoeva et al., 2013; Neiditch et al., 2006; Alvarado et al., 2010), to the polarity (Li and Gundersen, 2008) and division (Knoblich, 2001) of cells, and all the way to phenotypic asymmetry of whole animals (Levin, 2005). Specifically in the field of sensor-effector communication, asymmetry is emerging as a critical aspect of both signal integration (Kim et al., 2017; Neiditch et al., 2006; Narayanan et al., 2014; Chervitz and Falke, 1996) and regulation of various output functionalities (Kim et al., 2017; Moore and Hendrickson, 2012; Hu et al., 2013). An interesting group of environmental sensors are light-regulated photoreceptors; proteins that interact with various cofactors to convey light responsiveness to different qualities and intensities of light (Fraikin et al., 2013). These photoreceptors control complex processes in all kingdoms of life ranging from phototaxis in prokaryotes (Gomelsky and Hoff, 2011) to intricate regulatory networks of photomorphogenesis in plants (Fraser et al., 2016) or entrainment of circadian rhythms in animals (Cashmore, 2003). As far as naturally occurring light regulated functionalities are concerned, current evidence for asymmetric properties of the frequently oligomeric photoreceptor systems is mainly observed in the family of plant phytochromes where two different types of asymmetry have been implicated in providing flexible light-regulated systems. The first one is a consequence of the evolutionary duplication of phytochrome genes and the observation that some family members only form mixed heterodimers, for example Arabidopsis thaliana phyC and phyE only form heterodimers with phyB (Mathews and McBreen, 2008; Clack et al., 2009; Liu and Sharrock, 2013). The second form of asymmetry relates to the functional state of each individual light responsive module in either classical homodimeric or mixed heterodimeric red light photoreceptors. Phytochromes generally interconvert between an inactive red-light absorbing (Pr) and a physiologically active far-red-light absorbing (Pfr) species. Different biophysical properties of functional heterodimers featuring a Pfr/Pr assembly have been suggested as one plausible model to explain differences in morphological development at different photon flux densities of actinic light (Casal et al., 1998; Klose et al., 2015; Hennig and Schäfer, 2001), extending previous models that range from differences in degradation (Clough and Vierstra, 1997) to interactions among different phytochrome family members (Sharrock and Clack, 2004). Our characterization of the bacterial phytochrome IsPadC (phytochrome activated diguanylyl cyclase from Idiomarina species A28L) shows that structural rearrangements at the coiled-coil sensor-effector linker that increase enzymatic activity are coupled to heterodimer formation characterized by two different functional phytochrome states. Based on the functional implications of a quasi-translational switching between two coiled-coil conformations coupled to asymmetric changes of the sensory modules, such a mechanism of sensor-effector cross-talk might be more widespread than currently believed, both in phytochrome-like protein signaling and in regulatory mechanisms of dimeric enzymatic functionalities. In canonical phytochromes such asymmetric heterodimers feature one dark-adapted bilin conformation (Pr, cofactor in its ZZZssa configuration [Murgida et al., 2007]) and one activated Pfr state with bilin isomerized at the C15-C16 methine bridge (ZZEssa [Salewski et al., 2013]). Changes in the local environment of the cofactor affect the whole photosensory module (PSM) since the bilin chromophore interacts with different regions of the PSM. In bacterial phytochromes the bilin chromophore is covalently linked via a thioether linkage to a conserved cysteine residue located in the N-terminal extension (NTE), an α-helix preceding the N-terminal Period/ARNT/Single-minded (PAS) domain (Lamparter et al., 2004). The main stabilization of the open-chain tetrapyrrole cofactor is mediated by a cGMP phosphodiesterase/adenylyl cyclase/FhlA (GAF) domain following the PAS domain. The complete PSM of canonical phytochromes features an additional phytochrome-specific (PHY) domain at the C-terminus that stabilizes the photoactivated Pfr state via residues from a domain extension, the PHY-tongue, that interacts with the bilin binding pocket in the GAF domain and undergoes a conformational rearrangement from β-hairpin to α-helix upon Pr-to-Pfr photoconversion (Takala et al., 2014; Yang et al., 2009; Anders et al., 2013; Burgie et al., 2016). Here, we show how structural rearrangements in the vicinity of the cofactors of a functional Pfr/Pr heterodimer affect additional functional elements of the PSM and how these asymmetric dimers influence downstream signaling partners on a molecular level. Specifically, Pfr formation is coupled to a quasi-translational rearrangement of one helix in the coiled-coil sensor-effector linker element that enables switching between two conformational states. While these molecular details are important for the understanding of bacterial diguanylyl cyclase regulation, they also have far reaching implications for the structurally related nucleotidyl cyclases, where the importance of the preceding helical elements has only recently been appreciated (Ziegler et al., 2017; Lindner et al., 2017; Etzl et al., 2018) and linked to the occurrence of genetic diseases (Vercellino et al., 2017). In comparison to functional details of other characterized phytochrome systems that form active Pfr/Pfr homodimers, our results reveal an interesting molecular mechanism for the evolutionary adaptability of various sensor-effector systems. Considering that the rational design of novel sensor-effector combinations is a critical aspect for the rapidly developing field of optogenetics, the consideration of asymmetric functional states will be beneficial for understanding and optimizing initial designs of promising new light-regulated functionalities. Our previous characterization of the IsPadC system revealed that the phytochrome – diguanylyl cyclase (DGC) linker region populates two different coiled-coil register conformations that influence the enzymatic activity of the effector (Gourinchas et al., 2017). To test this hypothesis, amino acids at special positions of the coiled-coil were replaced to either destabilize or stabilize the presumably stimulating register conformation (Figure 1a). Previously, the corresponding sequence variants of the coiled-coil register were used in screening assays - IsPadCReg1 (IsPadC D504L A518L; constitutively inactive) and IsPadCReg2 (IsPadC S505V A526V; constitutively active) – and a detailed biochemical characterization was only provided for variants with parts of the coiled-coil deleted (Gourinchas et al., 2017). This time we focused entirely on the sequence variants with identical linker length and included an additional construct, IsPadCReg2.a (IsPadC S505V N512V N519V A526V), that is further stabilized in the stimulating register. To this end, we substituted the highly conserved, polar asparagine residues at the generally hydrophobic a positions of the coiled-coil in its stimulating register 2 conformation with valine residues (Figure 1 and Figure 1—figure supplement 1a–c). Employing a Congo red-based screening system for cyclic-dimeric-GMP production in E.coli (Antoniani et al., 2010), we show that IsPadCReg2.a, comparable to IsPadCReg2, is constitutively active under both dark and light conditions, whereas IsPadCReg1 is always inactive (Figure 1b). All three constructs were expressed in an E. coli strain coexpressing heme oxygenase to isolate holoproteins loaded with the biliverdin co-factor and to enable a more detailed biochemical characterization. It should be noted that so far none of the IsPadC constructs tested could be purified as apoprotein as they appear to irreversibly aggregate inside the cells in the absence of their cofactor. Therefore, all final protein preparations correspond to fully loaded holoproteins of each construct. A three-step purification procedure, consisting of an affinity, a reverse affinity and a size-exclusion chromatography step, allowed isolation of all full-length proteins to apparent homogeneity. Based on the elution volume of the purified proteins in the size exclusion step, all variants form stable dimers in solution. All subsequent biochemical and biophysical experiments were performed with protein samples obtained by this procedure. IsPadC constructs and their functional characterization. (a) Schematic representation of IsPadC and coiled-coil linker variants. Individual domains are colored in dark gray, violet, blue, green, orange, and red for the N-terminal extension (NTE), PAS, GAF, PHY, coiled-coil (cc), and DGC domains, respectively. The coiled-coil sequence is shown for each linker variant with red-colored residues indicating substituted amino acids. Bold letters refer to the hydrophobic a and d positions of the abcdefg heptad repeat units of the coiled-coil. Wild-type and IsPadCReg1 are expected to feature the inhibiting coiled coil register 1, whereas IsPadCReg2 and IsPadCReg2.a are stabilized in a different coiled-coil register referred to as register 2 (stimulating). (b) In vivo screening of DGC activity. IsPadC shows the expected increased red coloration upon red light illumination activation (Gourinchas et al., 2017). By contrast the coiled coil variant stabilized in the inhibiting register (IsPadCReg1) shows no activity as reflected by a white coloration, whereas the variants stabilized in the stimulating register (IsPadCReg2, IsPadCReg2.a) show light-independent red coloration. (c) UV/Vis characterization of IsPadC showing the dark state spectrum in comparison to one obtained directly after red light illumination. 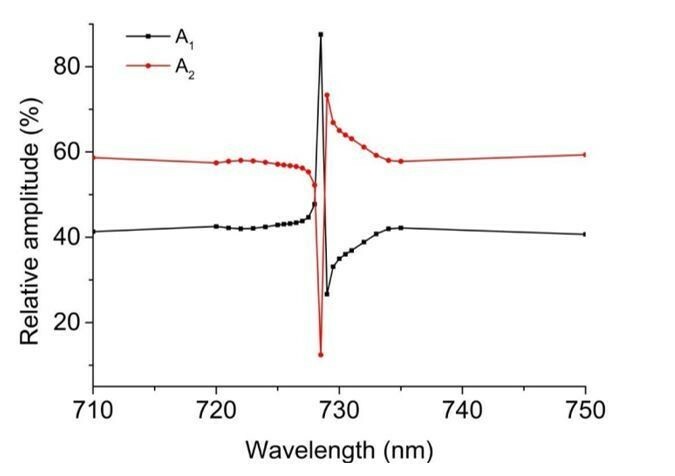 For comparison, spectra acquired under identical light and measurement setting using D. radiodurans phytochrome (DrBphP) are shown (d) Effect of red light photon flux density on enyzmatic activity and on the spectral contribution at 750 nm. To account for the different protein concentrations, all measurements were scaled based on the respective dark state absorption of the Pr peak. To account for reduced Pr contributions due to partial light activation by the measuring light at low protein concentrations, the 750 nm contributions were subsequently normalized to saturating red light conditions of the 2 µM sample. Full spectra at various flux densities are shown for the 2 µM IsPadC concentration in the inset. (e) Thermal recovery of 15E biliverdin followed by denaturation of 10 μM native samples at different time points. For comparison DrBphP has been denatured in the dark and under illuminated conditions. During our previous characterization of IsPadC, we observed only partial formation of the Pfr state even under constant red light illumination (Gourinchas et al., 2017), which clearly differs from absorption spectra of other well-characterized bacteriophytochromes, such as for example Deinococcus radiodurans phytochrome (Wagner et al., 2005; Wagner et al., 2007) (DrBphP, Figure 1c), or bathyphytochromes that have Pfr as their ground state (Yang et al., 2009; 2011). In an attempt to better understand the molecular basis for the incomplete Pfr spectrum under steady-state red light conditions, we analyzed the effect of actinic light intensity and the protein concentration on the light-state spectrum. As shown in Figure 1d decreasing protein concentrations correlate with a reduction of the required light intensity to increase the 750 nm contribution, however, in all cases similar steady-state light-activated spectra of IsPadC are populated. Importantly, the sigmoidal profile obtained for activation of the biliverdin cofactor correlates with the enzymatic readout of the effector domain. Since light intensity is apparently not limiting the steady-state Pfr population under red light, we denatured IsPadC directly after illumination with saturating red light to address the isomerization state of the biliverdin cofactor. To this end, we followed the protocol of denaturation under acidic conditions described by Thümmler et al. (Thümmler et al., 1981) and observed that more than 90% of the biliverdin population is present as the 15E isomer during constant red light illumination (Figure 1e). The comparison with DrBphP clearly shows that similar levels of the isomerized biliverdin species are present upon red light activation, however, even complete isomerization of biliverdin apparently does not allow full population of the Pfr state in the case of IsPadC (cf. Figure 1c). This is either due to different biliverdin environments of the two protomers forming an IsPadC dimer or due to a steady-state equilibrium of Pfr with preceding intermediates along the activation pathway (Borucki et al., 2005; Buhrke et al., 2018; Dasgupta et al., 2009). By following the thermal reversion of 15E biliverdin to its 15Z isomer by means of quenching the protein after different dark adaptation times, mean lifetimes and amplitudes are observed that are comparable to those obtained for the native protein (inset of Figure 1e), which indicates a direct correlation of the native spectral properties with the isomerization state of biliverdin. Interestingly, at the high concentrations of 10 µM required to perform this experiment, fitting of the data required the sum of three exponentials (Table 1 in Supplementary file 1). While this fitting function and the obtained parameters differ from previously reported data for IsPadC (Gourinchas et al., 2017), we realized that these observations directly correlate with the protein concentration used for the different experiments. At low protein concentrations, fitting with the sum of two exponentials is sufficient to describe the recovery kinetics, however, increasing the protein concentration results in apparently slower recoveries until at some point the inclusion of a third exponential is indicated – eventually providing comparable values for the time constants of the first two phases (cf. Table 1 in Supplementary file 1). Importantly, also changing the salt concentration of the samples significantly impacts the obtained recovery kinetics. This, in combination with the effect of protein concentration, points towards an involvement of the protein oligomerization state and/or non-specific interactions of structural elements close to the chromophore binding site in modulating the recovery kinetics of the biliverdin cofactor. *Comparison of product formation between the various constructs was performed for initial reaction rates at 200 µM GTP. Initial rates are quantified from experimental triplicates for three time points, and the sample standard deviation of individual points contributed to the error estimation of the linear fit that is used to calculate the initial rate of product formation. The SE of the estimate from the linear regression is used as error indicator. The spectroscopic characterization of the three IsPadC register variants revealed no major differences compared to the wild type with respect to their dark- and light-state UV/Vis absorption spectra (Figure 1—figure supplement 2a–c). The absorption maxima of the Pr states are shifted slightly from 710 nm for the wild-type to 708 nm for both IsPadCReg1 and IsPadCReg2.a as well as to 707 nm for IsPadCReg2. Consequently, the difference spectra of light-dark (Figure 1—figure supplement 2a–c) show analogous changes in maxima of the negative Pr signals, whereas the signals associated with Pfr formation remain almost unaffected. The thermal recoveries to the ground state Pr absorption spectra, however, are pronouncedly affected by the amino acid substitutions in the coiled-coil linker (Table 1 in Supplementary file 1 and Figure 1—figure supplement 2d). We also observed that the protein concentration has a pronounced effect on the recovery kinetics of the register variants and have therefore decided to use 2 µM protein samples for the comparison of individual protein variants. Since this concentration differs from that used for the initial IsPadC characterization (Gourinchas et al., 2017) the reported values in Table 1 in Supplementary file 1 also differ slightly from previously reported data for IsPadC (Gourinchas et al., 2017). Importantly, recovery kinetics of wild-type IsPadC and the IsPadCReg2 variant could be fitted with the sum of two exponentials, whereas IsPadCReg1 and IsPadCReg2.a required the addition of a third exponential function to provide satisfying fits already at low protein concentrations. Interestingly, the latter variants are presumably extensively stabilized in their coiled-coil registers (inhibiting register 1 and stimulating register 2, respectively) and feature at least one phase with extremely slow recovery, whose contribution to the overall amplitude differs pronouncedly (Figure 1—figure supplement 2d). Especially IsPadCReg2.a appears to be severely limited in fully recovering to the Pr ground state, which shows that the conformation of the coiled-coil register and its dynamics strongly influence the biliverdin environment. A closer inspection of the recovery kinetics by comparison of data measured at 710 nm (reformation of Pr) and 750 nm (depletion of Pfr and potential non-Pfr photoproducts) revealed that the time constants of individual recovery phases match between the 710 and 750 nm analyses. Interestingly, also the relative amplitudes contributing to individual phases at 710 and 750 nm appear to correlate for all constructs. While this observation might suggest that the recoveries do not involve photoproducts that significantly differ in their spectra from the Pr or Pfr absorbing species, it does not exclude the presence of closely related species such as for example meta-R states (Borucki et al., 2005; Buhrke et al., 2018; Wagner et al., 2008). The observation of a non-isosbestic recovery (Figure 1—figure supplement 2e) further supports the involvement of at least one colored species in addition to Pr and Pfr. In fact, the fairly constant amplitude contributions of the fastest phase of the thermal recoveries (~36%, cf. Table 1 in Supplementary file 1) suggest that this phase might correspond to the recovery of a biliverdin species with lower extinction coefficient bound to one PadC protomer, whereas the remaining phase(s) reflect the recovery of the second biliverdin species – most likely the classical Pfr state. A closer inspection of the thermal recoveries in the region of the expected isosbestic points between Pr and Pfr as well as Pr and meta-R (cf. ref [Borucki et al., 2005]) confirmed that the relative amplitudes of the individual contributions change significantly in this spectral region and that the maximal contribution of the meta-R and Pfr species lies close to the isosbestic point of the respective other contribution. Therefore, our initial spectroscopic characterization indicates that two different biliverdin species are stabilized upon red light illumination of IsPadC in the two protomers of the functional parallel phytochrome dimer. Such an asymmetric activation of IsPadC and its variants is also supported by the observations made for a construct lacking the PHY-tongue element (IsPadCΔ442-477::SG) (Gourinchas et al., 2017). The spectral characteristics of the illuminated IsPadCΔ442-477::SG construct are reminiscent of a composite of Pr and meta-R states considering meta-R species characterized for D207 and H260 variants of DrBphP (Wagner et al., 2008) or low temperature trapped forms of Agp1 from Agrobacterium tumefaciens (Borucki et al., 2005). The meta-R contribution is also supported by the characteristic changes in the light-dark difference spectrum compared to the other IsPadC variants (Figure 1—figure supplement 2f and Figure 1—figure supplement 3a). Importantly, acidic denaturation of IsPadCΔ442-477::SG revealed that in comparison to wild-type IsPadC only half of the biliverdin population can be isomerized to the 15E form (Figure 1—figure supplement 3b). The biliverdin cofactor bound to the respective other protomer of the dimeric species radiatively decays to the ground state rather than isomerizing, as shown by the significantly increased fluorescence of IsPadCΔ442-477::SG (Figure 1—figure supplement 3c). Interestingly, the spectral properties of this partial light-activated state are retained over hours (Figure 1—figure supplement 3a) and even over-night incubation does not allow recovery to the Pr ground state (Gourinchas et al., 2017). These data are consistent with a mechanism of IsPadC light activation involving light-induced isomerization of both biliverdin molecules of dimeric IsPadC. However, only one biliverdin moiety can undergo all subsequent structural rearrangements to obtain a classical Pfr state. The second biliverdin is most likely trapped in an early meta-R like conformation. This asymmetry is more pronounced for the register variants stabilized in register 2, where the Pfr environment is significantly stabilized relative to the wild-type and the IsPadCReg1 variant. Considering that the stimulating register and activation of enzymatic activity by illumination are coupled in wild-type IsPadC, we also had a closer look at the effect of stabilizing the coiled-coil in the two registers on catalytic turnover of GTP to c-di-GMP. In order to quantify the light regulation capacities of individual IsPadC register variants we employed an HPLC-based assay that enables baseline separation of the substrate GTP, the pppGpG intermediate and the product c-di-GMP. None of the analyzed register variants showed significant levels of intermediate formation as observed for IsPadC homologs or some linker deletion variants characterized previously (Gourinchas et al., 2017). Similar to IsPadC the conversion of substrate to product tends to be inhibited by increasing substrate concentrations, however, this phenomenon is less pronounced for both variants designed to stabilize the stimulating register 2 (Figure 1—figure supplement 4a–c). Table 1 summarizes the obtained rate constants for product formation at a substrate concentration of 200 µM, which corresponds to the maximum of GTP conversion for IsPadCReg2. At this concentration, no light regulation can be observed for IsPadCReg1 and IsPadCReg2.a, whereas IsPadCReg2 still shows residual stimulation of DGC activity by red light (roughly 2-fold). Considering that IsPadCReg2 activity can be increased whereas IsPadCReg2.a cannot, indicates that a too strong stabilization of the coiled-coil in the stimulating register can have negative effects for c-di-GMP formation. Apparently, the coiled-coil conformation of register 2 has a positive effect on enzymatic activity, but also the conformational dynamics of this structural element influence overall enzymatic turnover of the IsPadC system. 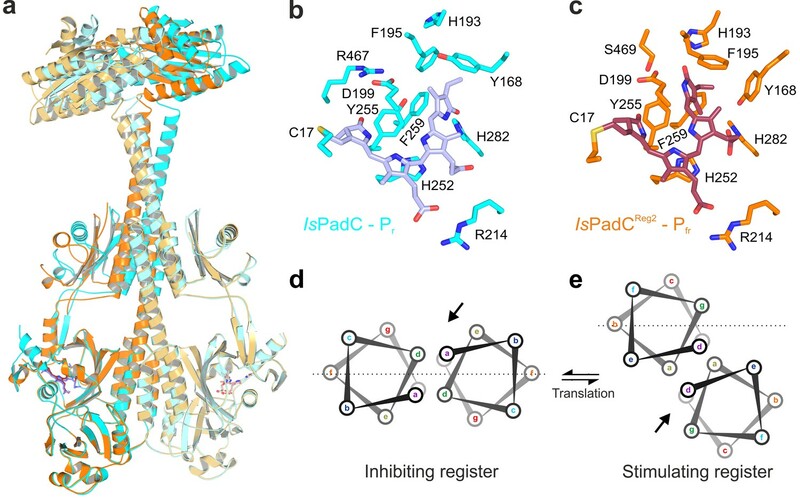 Addressing the structural implications of the stimulating register 2 conformation was enabled by the crystallization of IsPadCReg2 under dark conditions. Solving the crystal structure by molecular replacement (MR) using data to 2.85 Å (Table 2 in Supplementary file 1) was only possible after splitting the dark-state wild-type IsPadC structure into individual subdomains, due to substantial structural rearrangements of the overall IsPadCReg2 structure compared to the wild-type (Gourinchas et al., 2017). Even though IsPadCReg2 and wild-type IsPadC form crystals with the same overall lattice, we observed interesting rearrangements in the DGC effector domains that are coupled to the transition of the coiled-coil into the expected register 2 conformation. In addition, one PHY domain and its associated tongue element differ substantially from the dark-state IsPadC structure described previously (Gourinchas et al., 2017). In fact, already after the initial placement of all IsPadC domains by MR, the density of one protomers PHY-tongue extension did not match the β-hairpin structure characteristic for the dark-state Pr environment of biliverdin. Rather the electron density supported an α-helical element that is usually only observed for Pfr-conformations (Takala et al., 2014; Yang et al., 2009; Burgie and Vierstra, 2014) (Figure 2a–b and Figure 2—figure supplement 1). A closer inspection of the cofactor binding site revealed that also biliverdin in its classical ZZZssa conformation would not fit into the observed electron density. However, models of biliverdin in its isomerized and rotated 15E conformation nicely explain the observed electron density as supported by the polder OMIT maps (Liebschner et al., 2017) of the co-factor region (Figure 2—figure supplement 2). The structural rearrangements of the biliverdin environment are, however, only observed for one protomer, whereas the other protomer features the expected dark-state Pr environment observed for both protomers in the wild-type IsPadC structure (Gourinchas et al., 2017). Therefore, the IsPadCReg2 structure features an asymmetric dimer (Figure 2a) that is composed of one Pfr biliverdin environment (protomer A) and one Pr environment (protomer B). In addition to the helical tongue and the ZZEssa biliverdin configuration, also the side chains of residues Y168, H193 and F195 in the proximity of the rotated D-ring change their rotamer positions as described for other phytochrome Pfr states (Takala et al., 2014; Yang et al., 2009; Burgie and Vierstra, 2014) (Figure 2b and Figure 2—figure supplement 2). Asymmetric activation of a bacteriophytochrome dimer. (a) Crystal structure of IsPadCReg2 in cartoon representation with individual domains colored according to Figure 1a. Within the dimer, the activated protomer is highlighted in bold colors. The biliverdin chromophore is colored in dark red and represented in sticks. (b) Close-up view of the biliverdin-binding pocket corresponding to the Pfr conformation, highlighting the secondary structure change of the PHY-tongue element. The 2Fo-Fc electron density map contoured at 1σ around the chromophore is shown as light blue mesh. Important residues are shown in sticks. For clarity residues 200–213 have been hidden from the view. (c) Top view of the asymmetric GGDEF dimer induced by the coiled-coil linker helix translation. The GGDEF dimers are superimposed by aligning protomer A of IsPadCReg2 to the corresponding protomer B (residues 529–683) and the moved copy of the GGDEF dimer is represented as gray cartoon. (d) Superposition of the Pfr protomer of IsPadCReg2 (colored as in a) and the Pr protomer of IsPadCReg2 (colored in light gray) based on the PAS-GAF core (residues 1–312) of the respective chain A and B. Arrows indicate the structural rearrangements associated with Pfr formation. The pivot points and the associated lines show the hinge-like rearrangements at the central helical spine and the terminal PHY-helix extending into the coiled-coil linker. The Pfr/Pr heterodimer of the final IsPadCReg2 model is further supported by UV/Vis absorption spectra acquired for IsPadCReg2 crystals in comparison to wild-type IsPadC crystals. Averaging multiple spectra collected at different orientations of crystals relative to the incident measuring light, revealed a clear shoulder around 750 nm for the IsPadCReg2 crystal spectra (Figure 2—figure supplement 3). While a quantitative comparison to wild-type IsPadC crystal spectra is complicated by the preferred orientation of molecules in the crystal lattice and the resulting effect on extinction coefficients, the almost identical crystal lattices and morphologies of the two crystals enable a qualitative comparison of their spectra after baseline subtraction and scaling to their Soret band absorption. The comparison of both crystal spectra clearly demonstrates that the IsPadCReg2 crystals contain a mixture of Pr and Pfr populations that reflects the refined Pfr/Pr heterodimer. The asymmetry of the IsPadCReg2 structure extends from the biliverdin environment and the associated PHY-tongue to the PHY domain itself. Refolding of the tongue hairpin provides the structural flexibility for the PHY domain of chain A to reposition relative to chain B resulting in pronounced rearrangements at the PHY dimer interface. This repositioning of the PHY dimer correlates with the structural rearrangements of the coiled-coil to populate the register 2 conformation. In fact, the terminal PHY-helix directly extends into the coiled-coil sensor-effector linker and the whole structural element undergoes a hinge-like motion that is related to the structural transitions observed for various parallel phytochrome dimers (Gourinchas et al., 2017) (Figure 2c). Considering that more than 40 residues are part of this extended helical region, the global structural rearrangements are a complex mixture of individual sub-regions. Especially for the central part of the coiled-coil, the hinge-like separation of the corresponding residues is not very pronounced (Figure 3 and Figure 3—figure supplement 1) and, due to the absence of any rotational contribution to the transition between registers 1 and 2, is approximated as a quasi-translational movement throughout the manuscript. Interestingly, the hinge-like rearrangement at the central helical spine of the phytochrome module breaks the Arg327-Asp494 salt bridge at the PHY interface. This places the sidechains of Arg327 of both protomers in close proximity potentially contributing to the dynamic nature of the PHY interface upon illumination (Figure 3—figure supplement 1c). Structural rearrangements in the dimer conformation upon PHY-tongue refolding. (a) Superposition of the IsPadC dark-state structure (colored in cyan) with the activated IsPadCReg2 structure (colored in orange) based on the PAS-GAF cores (residues 1–312) of the respective chains B. The superposition shows the quasi-translational rearrangement in the middle of the coiled-coil linker associated with PHY-tongue refolding of one protomer. The superposition of the Pr-state phytochrome protomers of IsPadC and IsPadCReg2 (respective chains B) is almost identical (RMSD of 0.26 Å over 347 Cα-atoms). (b–c) Stick representation of residues around the biliverdin D-ring for the IsPadC Pr-state (b) and the IsPadCReg2 Pfr-state (c), respectively. The ZZEssa configuration of biliverdin results in rotamer repositioning of Tyr168, Phe195, His193, Tyr255, and results in loss of the Asp199-Arg467 salt bridge between the GAF domain and the PHY-tongue. (d–e) The stimulating register 2 conformation of the coiled-coil linker is populated by translation of one linker helix upon PHY-tongue refolding. The quasi-translational reorientation of the coiled-coil register extends to the very end of the sensor-effector linker, which is directly linked to the strictly conserved DXLT motif of DGCs (Römling et al., 2017). The structural consequences of the coiled-coil rearrangement are a different spacing of the two structural elements corresponding to the functionally important DXLT sequence in the dimeric assembly. Since these structural elements are directly linked to the open active site at the interface of the two GGDEF domains, the coiled-coil register switching apparently has direct implications for DGC activity. In this context, it should be emphasized that the IsPadCReg2 structure has been solved in almost the same crystal lattice as the wild-type IsPadC dark state structure. This implies that the conformational rearrangements of the DGC dimer are associated with the coiled-coil register transition and the asymmetric activation of the sensory module rather than being affected by lattice specific crystal contacts. Interestingly, superimposing the DGC dimer onto itself by aligning one protomer with the corresponding other protomer (residues 529–683 chain A over chain B) reveals a pronounced asymmetry of the DGC dimer interface in IsPadCReg2 (Figure 2c), which significantly differs from the DGC dimer interface of the IsPadC dark state (RMSD 0.370 over 141 α-carbon and RMSD 0.267 over 138 α-carbon of chain A superimposed over chain B for IsPadCReg2 and IsPadC, respectively). Overall we observe a rotational movement of the DGC protomer linked to the repositioned coiled-coil linker helix. This leads to an opening of the DGC dimer at one side and a closing at the other side (Figure 2c and Figure 3—figure supplement 2a–b). In the absence of substrate or product bound to the IsPadCReg2 structure it is, however, not possible to associate a specific functional state to this DGC architecture. Nevertheless, the fact that IsPadCReg2 features constitutively high GTP turnover suggests that the conformational opening of the DGC dimer might either increase the affinity for GTP and/or bring two GTP moieties after binding into an energetically favorable position to catalyze the first phosphodiester bond formation. Interestingly, the DGC dimer architecture does not resemble any deposited GGDEF dimer in an inhibited conformation (Chan et al., 2004; Wassmann et al., 2007; De et al., 2008; De et al., 2009; Navarro et al., 2009), suggesting that the observed dimer might correspond to a functionally important conformation along the catalytic cycle of DGCs. In fact, the relative position of the two catalytic GGEEF sites at the center of the DGC dimer is affected by the asymmetric rearrangements in IsPadCReg2 and the net effect is a shortened distance between the GGEEF sites potentially facilitating the contact between the C3 ribose hydroxyl group of one GTP and the alpha phosphate group of the respective other GTP molecule (Chan et al., 2004; Schirmer and Jenal, 2009) (Figure 3—figure supplement 2c). This could provide the geometry required for the initial phosphodiester bond formation step, generating the pppGpG intermediate. Subsequent structural rearrangements would then be required to complete the second phosphodiester bond formation step and ultimately the release of the c-di-GMP product. That the observed architecture corresponds to one functionally important state along this pathway is further supported by the observed asymmetry of specific conserved residues close to the binding site of the GTP base (e.g. Lys569 and Tyr670) that change their rotamer positions and relative orientation to the other protomer (Figure 3—figure supplement 2d). In fact, these structural rearrangements are similar to changes induced by substrate binding as observed in the GTP soaked wild-type structure (Gourinchas et al., 2017). Considering the importance of dynamic rearrangements during the catalytic cycle of converting two molecules of GTP to c-di-GMP via the pppGpG intermediate, it is unlikely that a single conformation observed in a crystal structure will correspond to ‘the active’ conformation of DGCs. To further address the importance of conformational dynamics on DGC activity and on the coupling of the coiled-coil region with both the enzymatic effector and the red-light sensor, we performed hydrogen-deuterium exchange experiments analyzed by mass spectrometry (HDX-MS). Extending our previous HDX-MS characterization of wild-type IsPadC (Gourinchas et al., 2017), we performed a complementary analysis with the IsPadCReg2 system, which is almost constitutively active but still shows residual light regulation of enzymatic activity. Comparing just the differences in deuterium incorporation between light- and dark-state conditions for the two systems reveals no major differences. For both the wild-type and the IsPadCReg2 variant we observed an increase in conformational dynamics in the PHY-tongue region, the central helical spine and the coiled-coil sensor–effector linker upon illumination (Figure 4). This increase in conformational dynamics, especially for the coiled-coil linker, has recently been implicated in increasing DGC activity by providing the conformational flexibility to switch between the two coiled-coil registers (Gourinchas et al., 2017). 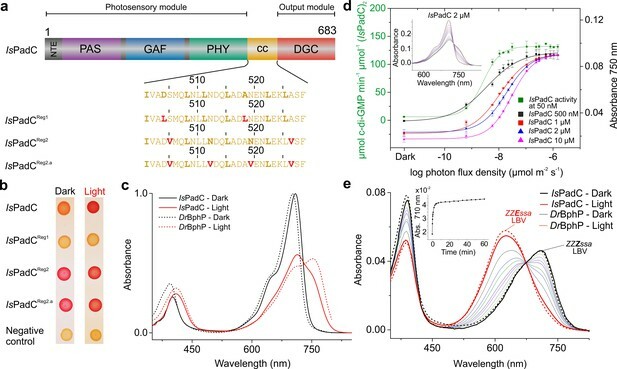 A closer inspection of the deuterium exchange kinetics, however, revealed that the conformational dynamics of IsPadCReg2, compared to the wild-type protein in either the dark-adapted state or during constant red light illumination, are reduced in several functionally important regions. This is especially true for the PHY-tongue region, the coiled-coil and a GGDEF element close to the GTP binding site (Figure 4 and Figure 4—figure supplement 1). The stabilization observed at the DGC dimer interface directly reflects the molecular structure of IsPadCReg2 with respect to the close interactions between the α0 helices and the DXLT motifs as well as the interaction of the α1/α2 and α4 helices on the closed side of the DGC interface. Obviously, the general stabilization of the GGDEF dimer also affects the conformational flexibility of the GGEEF motif. Comparison of the changes in conformational dynamics upon illumination of IsPadCReg2 and IsPadC. 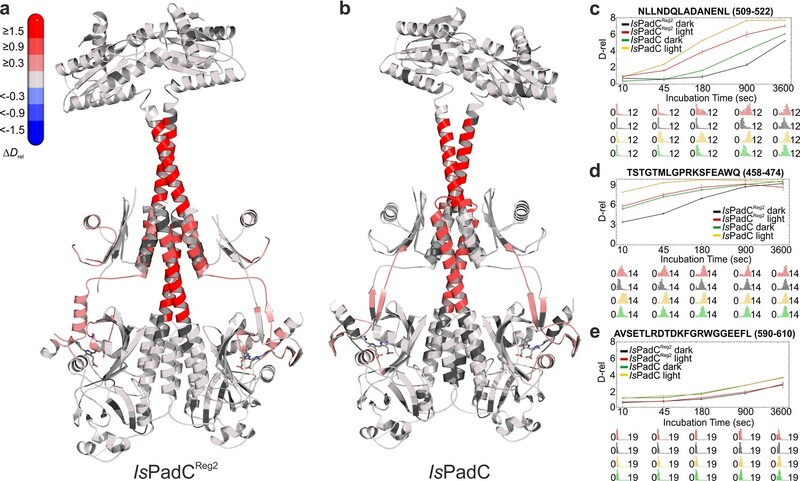 (a–b) Changes in conformational dynamics upon illumination of IsPadCReg2 (a) and IsPadC (b), respectively, evaluated by HDX-MS. Since time dependent deuterium uptake at the amide positions for different peptides correlates with the stabilization of both β-sheets and α-helices, the deuterium uptake of individual peptides can be related to the stability of the secondary structure elements in a defined region. Closer inspection of individual peptides (panels c–e), revealed that the absolute conformational dynamics of individual peptides differ substantially. The presented structures are colored according to the observed changes in relative deuterium incorporation (ΔDrel) between light-state and dark-adapted state (Drel light – Drel dark) after 15 min of deuteration. The changes in ΔDrel are indicated by the scale in the top left corner with blue corresponding to reduced deuterium incorporation and red reflecting increased exchange of amide protons upon red light illumination. The biliverdin chromophore is represented as sticks and colored in gray. (c–e) Comparison of deuterium uptake curves of IsPadCReg2 and IsPadC peptides in the coiled-coil linker region (c), in the PHY-tongue region (d), and in the GGEEF element of the DGC (e), respectively. Drel is plotted against the deuteration time for light- and dark-state HDX-MS experiments. The error indicators correspond to the sample standard deviation of triplicate measurements. The lower parts show software-estimated abundance distributions of individual deuterated species on a scale from undeuterated to all exchangeable amides deuterated. Of special interest are the reduced conformational dynamics of the coiled-coil, since we previously correlated an increase in conformational dynamics with an increase in activity. Because IsPadCReg2 is more active than the wild-type in the dark, the reduced dynamics observed for this variant suggest that it already populates a stable register 2 conformation in solution. The increase in deuterium incorporation upon illumination therefore only increases the dynamics of the system rather than switching to a specific register. Since IsPadCReg2 features a classical Pr state in solution, the structural rearrangements in the coiled-coil can apparently occur uncoupled from structural rearrangements in the biliverdin environment, for example linked to Pfr formation as observed in the crystal structure. These findings support the proposed switching mechanism between the two coiled-coil registers and show that both a structural component and a dynamic contribution are responsible for regulating enzymatic activity of the output module (Figure 5). A toggle mechanism between linker conformations modulates DGC activity. (a) Schematic representation of how DGC activity is modulated by the coiled-coil linker register and its intrinsic conformational dynamics. The transition between the inhibiting and the stimulating coiled-coil conformations is represented on the x-axis as the probability to be in the stimulating register. Under conditions where a switching between coiled-coil registers is possible the dynamics of the system are increased (blue curve). In combination with the structural contribution of the stimulating register for DGC activity (orange curve), the overall enzymatic activity is approximated as the sum of both contributions (dark curve). A large photodynamic range can only be obtained by a fine-tuned balance of conformational flexibility and structural differences of the coiled coil conformations. (b) Schematic model of PadC activation. In the dark, a stable β-hairpin conformation of the PHY tongue elements maintains the coiled-coil linker in its inhibiting conformational register. Upon red light illumination and isomerization of the biliverdin of one protomer, the dimeric interface of the PSM rearranges leading to more conformational freedom at the PHY interface allowing the population of the stimulating linker register that in turn facilitates GTP conversion at the GGDEF domains. As far as the proposed asymmetry of IsPadC upon illumination is concerned, the HDX-data cannot give a decisive answer. However, it is interesting to note that several peptides at the central helical spine, the PHY-tongue and the coiled-coil feature broad isotope distributions during deuterium incorporation (Figure 4—figure supplement 2). These broad distributions are indications for bimodal deuterium uptake that originates from two molecular species with different deuterium exchange kinetics, which would be in line with two biliverdin environments coupled to different PHY-tongue conformations under steady-state light conditions. In the IsPadC (Gourinchas et al., 2017) system (Figure 1a), the bacteriophytochrome module is linked to a diguanylyl cyclase (DGC) effector (Ryjenkov et al., 2005) and controls formation of the bacterial second messenger cyclic-dimeric-GMP (Römling et al., 2013) by red light (Figure 1a–b). A closer inspection of illumination properties of IsPadC revealed red light activation already at low photon flux densities, but also showed only partial Pfr formation at saturating light intensities (Figure 1c–d). Consequently, light-activated absorption spectra differ significantly from those of systems featuring highly stable Pfr states (Yang et al., 2009; Burgie et al., 2016). Nevertheless, acidic denaturation at saturating light conditions revealed more than 90% of the biliverdin to be isomerized to the 15E state (Figure 1e). In comparison to the D. radiodurans phytochrome (DrBphp) dimer that features two isomerized chromophores under saturating light (Figure 1e) and allows both phytochrome-tongue (PHY-tongue) elements to be refolded (Takala et al., 2014; Burgie et al., 2016), we hypothesized that differences in the local environment of the bilin cofactors or at the dimeric interface of IsPadC destabilize the establishment of Pfr environments on both protomers. Therefore, a fraction of chromophores, albeit being isomerized, might be trapped in a global Pr-like phytochrome environment that does not allow refolding of the tongue to populate the Pfr state. Based on the spectral characteristics of IsPadC in comparison to several variants of DrBphP (Wagner et al., 2008) and the importance of Pfr/Pr heterodimers in plant phytochrome-B signaling (Klose et al., 2015) the local structural environment of the biliverdin cofactor in the non-Pfr protomer most likely reflects a meta-R like state (Borucki et al., 2005) where side chains close to the biliverdin adapt their rotamer positions, however no tongue refolding can take place. In general, excitation of the biliverdin chromophore (Mroginski et al., 2007; Toh et al., 2010) is followed by fast isomerization and slower local structural changes around the chromophore binding pocket that are propagated to the effector domains in full-length proteins (Gourinchas et al., 2017; Björling et al., 2016). Refolding of the PHY-tongue region from a β-hairpin to an α-helical structure (Takala et al., 2014; Yang et al., 2009; Anders et al., 2013; Burgie et al., 2016) also results in rearrangements at the phytochrome dimer interface and highlights the cross-talk between biliverdin activation and conformational dynamics of the dimeric assembly. Along the line of the relevance of the dimer interface, disruption of the PAS-GAF bidomain dimerization has been shown to impact thermal reversion of Pfr in the case of DrBphP (Takala et al., 2015). Similarly, allosteric effects of the dimer interface were shown to influence the mode of biliverdin interaction in engineered fluorescent proteins (Stepanenko et al., 2016). The influence of the dimeric interface on properties of the two biliverdin cofactors is further supported by the stabilization of the coiled-coil sensor-effector linker in different constructs of IsPadC. Following thermal relaxation of the variants revealed a pronounced effect of stabilization of register 2 on the recovery of the Pfr contribution. At the same time, the fast reverting meta-R component is only slightly influenced by the conformational dynamics at the dimer interface. Most likely, the molecular mechanism of meta-R recovery follows a shunt-pathway similar to that described for Agrobacterium fabrum, Agp1 and Agp2 (Buhrke et al., 2018). The different effects of the dimer interface on the recovery of the different biliverdin species are an additional indication for the structural asymmetry of light-activated IsPadC. In fact, the correlation of increased Pfr lifetimes with increased stabilization of the register 2 conformation of the linker at the same time as sustained prevention of Pfr formation on the second protomer, as indicated by constant amplitudes for the recovery of the meta-R component (Table 1 in Supplementary file 1), shows that the biliverdin environments are functionally coupled via cooperative effects at the dimeric assembly (Klose et al., 2015). This special case of negative cooperativity indicates that Pfr associated conformational changes in one protomer break the global symmetry of the dimer and result in an asymmetric assembly that prevents reorganization of the second biliverdin binding site and/or associated functional elements such as the PHY-tongue region. Further support for the stabilization of heterodimers via the dimer interface originates from the characterization of an IsPadCΔ442-477::SG variant (Gourinchas et al., 2017) in which the PHY-tongues have been replaced by a short loop. The increased fluorescence and the fact that only half of the biliverdin population can be isomerized to the 15E state (Figure 1—figure supplement 3b–c) support the importance of the PHY-tongue elements for stabilization of the biliverdin environments. At the same time, the observed asymmetry in the IsPadCΔ442-477::SG construct shows that structural changes at the dimer interface can stabilize different chromophore environments upon light activation of IsPadC; based on the reduced amplitude and the blue-shifted maximum of the light-dark difference spectrum (Figure 1—figure supplement 3a), we assume a composite of Pr and meta-R states to be present upon light activation of IsPadCΔ442-477::SG. In IsPadC, structural rearrangements at the dimer interface modulate the conformation of the coiled-coil sensor-effector linker and thereby regulate DGC activity (Gourinchas et al., 2017). More precisely, the coiled-coil sequence of the linker region adopts two conformational registers leading to either DGC activation or inhibition (Figure 1b, and Figure 1—figure supplement 1). In fact, the stabilization of the coiled-coil in its inhibited register (IsPadCReg1) led to low, light-independent basal activity comparable to the IsPadC dark state. By contrast, stabilizing the stimulating register (IsPadCReg2) led to a highly active variant with a residual light-induced increase in enzymatic activity. The detailed characterization of variants of IsPadC featuring different degrees of stabilization of the inhibiting or stimulating linker registers revealed significant differences in functional regulation of the enzymatic effector (Figure 1b, and Table 1). In combination with the effects of the coiled-coil variants on properties of the photocycle described above, their direct influence on the enzymatic functionality of the output module highlights the central role of the coiled coil linker in both integrating the light signal and regulating DGC activity. Interestingly, the IsPadCReg2 variant features a high dark state activity and can be further stimulated by red light illumination, whereas IsPadCReg2.a, for which two conserved Asn residues in the coiled-coil element were exchanged by hydrophobic valines, is constitutively active and can no longer be affected by illumination (Figure 1b, and Table 1). The observed effect of substituting the Asn residues supports their functional relevance at central positions of the heptad units (Gourinchas et al., 2017; Fletcher et al., 2017) and indicates that a conformational switching between coiled-coil registers is required for optimal activation of DGC activity (Figure 5). The crystal structure of the IsPadCReg2 variant stabilized in the stimulating register shows that the structural rearrangements of the coiled-coil transition between the two registers, as required for signal integration (Gourinchas et al., 2017), are compatible with Pfr state formation in a single protomer. In combination with the spectral signature of a Pfr/meta-R heterodimer observed upon illumination of all IsPadC constructs, this further supports the possibility of an IsPadC heterodimer as a central functional species (Figure 1d). Upon isomerization and D-ring rotation of one biliverdin the conformational changes induced at the dimer interface might prevent structural reorganization of the PHY-tongue region close to the second biliverdin binding site. Depending on the degree of coupling between various functional elements, different equilibria of Pr, lumi-R, meta-R and Pfr states can influence the ultimate structural rearrangements in the phytochrome systems. Based on the assignments of meta-R transitions that involve structural rearrangement of the tongue region in other phytochrome systems (Björling et al., 2016; Stojković et al., 2014; Anders et al., 2014), we suspect that an early meta-R like state is enriched during steady state light illumination in IsPadC. The different stabilities of Pfr states in various dimeric phytochromes might therefore have evolved to optimize specific action spectra as well as to enable the formation of functional heterodimers. Eventually, the possibility to tune the relative amounts of various biliverdin environments by functionally important structural elements might also be involved in the adaptability of the sensory module to different output domains. The influence of the dimeric interface on the spectral photoisomerization properties has previously also been observed in inhibited photoconversion of the dimeric chromophore-binding domain of D. radiodurans phytochrome that can partially be reestablished upon monomerization (Auldridge et al., 2012). In fact, including the PHY domain in D. radiodurans phytochrome PSM constructs or addressing the full-length system results in full conversion to a Pfr/Pfr homodimer (Takala et al., 2015; Auldridge et al., 2012). Apparently, nature employs both Pfr/(meta-R or Pr) heterodimers and Pfr/Pfr homodimers as functional units for regulating downstream effectors. This appears to be true for bacterial phytochromes as well as evolutionary distant plant phytochromes, where asymmetric properties on the level of different protomers as well as different functional states of individual phytochromes are being employed to regulate complex cellular processes (Clack et al., 2009; Liu and Sharrock, 2013; Klose et al., 2015; Hennig and Schäfer, 2001; Sharrock and Clack, 2004). However, when considering other organisms, the description of functional asymmetry in photoreceptor oligomers is rather scarce (Heintz and Schlichting, 2016; Winkler et al., 2013), although it apparently represents an interesting evolutionary approach to modulate photochromic behavior and signaling diversities. In general, asymmetry is emerging as a critical aspect of signal integration (Neiditch et al., 2006; Narayanan et al., 2014; Chervitz and Falke, 1996) as well as regulation of output functionalities (Kim et al., 2017; Hu et al., 2013). Based on spectral data provided for several phytochrome systems, functional activation through Pfr state formation in a single protomer might be a prevalent mechanism conserved in the family of phytochrome-like sensors that has so far been underestimated (Tarutina et al., 2006; Yang et al., 2007; 2015; Loughlin et al., 2016; Essen et al., 2008). Interestingly, both the wild-type and the IsPadCReg2 crystal structures have been obtained from crystals grown under constant dark conditions. Even though both constructs display very similar Pr state spectra in solution (Figure 1c and ref [Gourinchas et al., 2017]. ), IsPadCReg2 always features a small shoulder around 750 nm indicating a subpopulation of species present in the Pfr conformation. Apparently the crystallization conditions favor the assembly of asymmetric Pfr/Pr heterodimers existing in equilibrium with the predominant Pr/Pr homodimer in solution. These heterodimers feature the coiled-coil in its stimulating register, which stabilizes one protomer in the Pr and the other in the Pfr conformation (Figure 2 and Figure 3). The enrichment of the Pfr species only occurs during crystal growth and not in solution, confirming that the amino acid substitutions in IsPadCReg2 alone are not responsible for the stabilization of Pfr under dark conditions, as observed in bathyphytochromes (Zienicke et al., 2013). Nevertheless, the Pfr/Pr heterodimer should not be considered a crystallization artifact, but rather reflects one conformational assembly of the full-length system that is energetically compatible with the stabilization of the coiled-coil in its stimulating register. The pronounced asymmetry in the IsPadCReg2 structure is characterized by one protomer in the Pr-state while the second protomer features a Pfr-conformation with its biliverdin chromophore in the 15E configuration and the associated PHY-tongue element rearranged into the characteristic Pfr α-helical conformation. Obviously in the refolded state, the PHY domains exhibit greater flexibility, leading to a less defined electron density for this region compared to the rest of the protein. The directly linked PHY-tongue elements that are stabilized by interactions with the GAF domains, however, feature a well-defined electron density leaving no ambiguity regarding their differences in secondary structure (Figure 2—figure supplement 1). The Pr-state protomer, with its characteristic β-hairpin conformation in the tongue element, superimposes very well with the corresponding protomer of the IsPadC dark state structure (RMSD of 0.26 Å over 347 Cα-atoms for the PSM alignment for the respective chains B, Figure 3—figure supplement 1). The superposition is only disturbed by some flexibility towards the end of the coiled-coil linker and the associated DGC. The Pfr protomer deviates from the Pr state of wild-type IsPadC as well as the Pr protomer of IsPadCReg2 by refolding of the PHY-tongue region into an α-helical structure that leads to a bending at the helical spine region triggering a quasi-translational movement of the associated PHY – coiled-coil – DGC region (RMSD of 1.56 Å over 402 Cα-atoms for the PSM alignment of IsPadCReg2 on IsPadC of the respective chains A). The directly linked GGDEF protomer repositions relative to the second DGC protomer increasing the asymmetry within the GGDEF dimer. By calculating the free energy of assembly dissociation (ΔGdiss) by PISA analysis (Krissinel and Henrick, 2007), we observed that the energetic stability of the PAS-GAF-PHY interface (residues 8–500) in the IsPadCReg2 structure is only slightly affected compared to the one calculated for IsPadC (Gourinchas et al., 2017) (ΔGdiss = 6.5 kcal mol−1 and 8.8 kcal mol−1, respectively). Moreover, the stability of the PAS-GAF-PHY-coiled-coil assembly in the IsPadCReg2 structure is in the range of the same assembly calculated for the IsPadC structure (Gourinchas et al., 2017) (ΔGdiss = 20.0 kcal mol−1, and ΔGdiss = 22.6 kcal mol−1, respectively), which suggests that the overall stability of the phytochrome sensor is only slightly affected by the structural rearrangement of the PHY-tongue and the coiled-coil linker. A closer look at the dimeric PHY interface shows that upon linker helix translation the Arg327 - Asp494 intermolecular salt bridges observed in the dark state structure of IsPadC are absent in the IsPadCReg2 structure thereby enhancing the conformational freedom at the PHY interface (Figure 3—figure supplement 1c). Interestingly, the asymmetry of the IsPadCReg2 structure is also reflected in several other amino acids at the dimeric interface, for instance Phe132, Gln137, Arg140, Met320 for the PSM interface, and His577, K569, Y670 at the DGC interface. Upon isomerization of the biliverdin cofactor, Tyr168 and Phe195 change their rotamer conformation to accommodate the D-ring rotation as already described for other phytochrome species (Yang et al., 2009; Anders et al., 2013; Burgie and Vierstra, 2014). Also His193 changes its rotamer to interact with the carbonyl oxygen of the rotated D-ring (Figure 3b–c). In addition, the tryptophan switch scenario (Anders et al., 2013; Burgie and Vierstra, 2014) is also observed for refolding of the IsPadC PHY-tongue. As far as downstream signaling of the activated PSM heterodimer is concerned, the crystal structure supports the switching mechanism between two coiled-coil registers proposed recently (Gourinchas et al., 2017). In contrast to the anticipated rotation mechanism, we observe a quasi-translational rearrangement (Figure 3a,d, and Figure 3—figure supplement 1) that is linked to a hinge movement of the whole PHY-coiled-coil linker region (Figure 2d). This type of functional rearrangement of the phytochrome dimer interface has also been observed by comparison of various phytochrome structures already at the PSM level (Gourinchas et al., 2017; Yang et al., 2015). More precisely, the refolding of the PHY-tongue is linked to a tilting of the central helical spine – PHY – coiled-coil region. This eventually causes the C-terminal parts of the coiled-coil linker to interact more tightly and repositions the directly following DXLT motifs at the dimer interface of the GGDEF domains. This highly conserved motif is directly linked to structural elements that are part of the open active site at the dimer interface of the GGDEF domain (Schirmer, 2016). In the absence of substrate, the coiled-coil linker rearrangement induces a different DGC dimer architecture due to a displacement of the DGC protomer linked to the photoactivated phytochrome protomer (Figure 2c). This results in a more open interface at one side of the dimer that potentially facilitates substrate binding or product release. In addition, we observed that the GGEEF motifs of IsPadCReg2 are positioned closer to each other, indicating that the two GTP substrates could be more closely interacting and potentially initiating the chemical reaction between the two molecules in an asymmetric fashion, as opposed to the symmetric binding of GTP in the dark inhibited conformation (Gourinchas et al., 2017). It should be noted, however, that the complex reaction mechanism of DGCs involves coordination of two GTP molecules, initial bond formation to form the asymmetric pppGpG intermediate, structural rearrangements to form the second linkage of c-di-GMP and subsequent product dissociation. Therefore, a single crystallographic snapshot cannot correspond to ‘the active’ conformation of DGCs; the dynamic nature of GGDEF dimerization (Gourinchas et al., 2017; Chan et al., 2004; Schirmer, 2016; Zähringer et al., 2013) rather supports a model in which the coiled-coil register switching influences the conformational sampling of different dimeric interfaces. In the case of the stimulating register 2 conformation of the coiled-coil, the sampling of dimers compatible with the geometry required for the DGC reaction to proceed is facilitated. Since an additional increase in activity can be achieved by stimulating the conformational dynamics of the coiled-coil by illumination, not a static dimer interface, but rather a dynamic assembly of GGDEF protomers, enables optimal DGC activity. Interestingly, the superposition of the IsPadCReg2 structure with the GTP soaked IsPadC structure (Gourinchas et al., 2017) suggests that GTP binding within the DGC dimer induces a slight translation of the coiled-coil linker towards the stimulating register (Figure 3—figure supplement 1a,b). Therefore, the full-length system involves a complex cross-talk between sensor and effector domains that influence each other based on finely tuned dimer interfaces. The coiled-coil as central communication hub integrates the functional state of input and output modules, indicating that the rational design of artificial sensor-effector couples needs to consider this complex interplay of dynamic dimeric interfaces of sensor and effector domains as well as properties of the coiled-coil linker. The importance of conformational dynamics was also confirmed by hydrogen-deuterium exchange coupled to mass spectrometry (HDX-MS) experiments (Figure 4, and Figure 4—figure supplement 1). Interestingly, phytochrome activation by red light results in similar effects for both IsPadC and IsPadCReg2. Both constructs showed an overall increase in deuterium uptake upon red light illumination indicating a light-induced increase of conformational dynamics. However, the relative amount of deuterium exchanged under dark and light conditions is lower for peptides in functionally important regions of IsPadCReg2 compared to IsPadC. This general decrease of conformational dynamics of IsPadCReg2 highlights the molecular cross-talk between different functionally important elements (Gourinchas et al., 2017). The decrease of deuterium uptake of coiled-coil peptides correlates with the stabilization of the linker in the stimulating register conformation as anticipated for the amino acid substitutions in IsPadCReg2. The fact that this variant has a higher turnover rate constant in the dark compared to IsPadC indicates that the coiled-coil conformation in the stimulating register has a positive effect on enzymatic activity of the DGC (Figure 5a). However, HDX-MS shows that illumination increases the dynamics of the coiled-coil and thereby destabilizes the coiled-coil arrangement, which results in an additional increase in enzymatic activity; this implies that, in addition to the register conformation, the overall dynamics of the system play an important role in modulating DGC activity (Figure 5a). Importantly, HDX-MS measurements derive from an ensemble measurement of all peptides in the protein dimer. Therefore, it is not possible to specifically address asymmetric stabilization or destabilization in the context of the full-length protein dimer in solution. However, the broad deuterium uptake distributions of PHY-tongue peptides upon illumination (Figure 4e) are indicative of a deuterium exchange regime that considers two conformational states with pronounced differences in deuterium uptake kinetics. Even if these observations are no direct proof of a heterodimer in solution, they suggest that different conformational states of the PHY-tongue elements co-exist upon light activation of the PadC system. This conformational coupling is also reflected in the crystal structure of IsPadCReg2 and its pronounced differences to the inactive wild-type structure. Even though the Pfr/Pr heterodimer conformation is not the energetically most favorable in solution, it does represent one functional form of the dimeric assembly that highlights the cross-talk between the site of light activation and the central regulatory element for enzymatic activity – the coiled-coil linker. Additional experiments to address the directionality of signal transduction by producing apoproteins of IsPadCReg2 and wild-type IsPadC could provide interesting additional insights, however, the isolation of apoprotein is not feasible in the IsPadC system. Figure 5 summarizes the observed influence of the coiled-coil register conformation and the dynamics of the system for regulating output activity of the DGC in a simplified model. To that end, the structure of IsPadCReg2 and the structural changes associated with activation will help to readdress the activation mechanism of other phytochromes that are commonly used for designing optogenetic tools (Tischer and Weiner, 2014; Shcherbakova et al., 2015). In the context of phytochrome function, our study confirms that functional Pfr/meta-R or Pfr/Pr phytochromes exist and that, while chromophore isomerization coupled to reorganization of the PHY-tongue region appears to be conserved in phytochromes, the extent to which this affects the output domain is tuned by the dimeric phytochrome interface via modulation of the effective population of Pfr-states as characterized by the structural rearrangements of the PHY-tongue and the PHY dimer interface. Ultimately, the flexibility to stabilize different functional states via the dimer interface enables phytochromes to be adapted to various effectors and also enables tuning of the action spectra by reducing the cross-section with inactivating far-red light. Linker register variants were produced by site-directed mutagenesis following the protocol described by Liu et al. (Liu and Naismith, 2008) using pETM-11 IsPadC based plasmids as templates (Gourinchas et al., 2017) (used primers are listed in Table 3 in Supplementary file 1). IsPadC variants were expressed and purified as described in detail previously (Gourinchas et al., 2017). Briefly, (His)6-tagged holoproteins were expressed in BL21 (DE3) containing the previously generated pT7-ho1 helper plasmid (Gourinchas et al., 2017) to co-express heme oxygenase (HO-1). Cells grown at 37°C in LB medium completed with 0.36% (w/v) glucose and 10 mM MgCl2 were cooled to 16°C and the medium was supplemented with 10 mg liter−1 δ-aminolevulinic acid prior to induction with 0.25 mM isopropyl-β-D-thiogalactopyranoside (IPTG) for ~15 hr. After cell harvesting, the soluble lysates obtained by combined treatment with lysozyme (100 µg ml−1) and sonication (2 × 5 min, 100 W, continuous mode; Labsonic L, Sartorius, Göttingen, Germany) were separated by ultracentrifugation (206,000 g), and affinity-purified on a Ni2+-Sepharose matrix (Ni Sepharose 6 Fast Flow, GE Healthcare, Little Chalfont, UK). After a washing step (lysis buffer containing 30 mM imidazole), proteins were eluted (lysis buffer containing 250 mM imidazole) and dialyzed overnight at 4°C in presence of histidine-tagged tobacco etch virus (TEV) protease (~1:16 TEV/substrate). Afterwards TEV and cleaved histidine tag were removed from the protein solution by reloading the dialyzed protein onto the Ni2+ column and collecting the flow through. An additional step of size-exclusion chromatography on a 16/60 Superdex 200 prep grade column (GE Healthcare) was performed before proteins were concentrated in the buffer listed in Table 3 in in Supplementary file 1 (Amicon Ultra-15; Merck Millipore, Burlington, MA), aliquoted, flash-frozen in liquid nitrogen and conserved at −80°C until needed. For characterization of steady-state kinetics of the IsPadC variants, the proteins were subject to an additional size-exclusion chromatography run with a 10/300 Superdex 200 increase analytical grade column (GE Healthcare) in order to exchange the protein into HPLC buffer (Table 3 in in Supplementary file 1) and to remove potential protein aggregates caused by sample thawing. To screen for diguanylyl cyclase activity, we followed our previously described protocol (Gourinchas et al., 2017) adapted from the method described by Antoniani et al. (Antoniani et al., 2010). E. coli BL21 (DE3) co-expressing the pT7-ho1 plasmid and transformed with pETM-11 IsPadC based plasmids were cultivated at 30°C to OD600 0.5 in YESCA medium (casamino acids 10 mg ml−1 and yeast extract 1.5 mg ml−1) supplemented with MgSO4 (0.05 mg ml−1), FeSO4 (0.5 µg ml−1), kanamycin (30 µg ml−1), and chloramphenicol (34 µg ml−1). After 4 hr induction at 16°C with 0.25 mM IPTG in the presence of 10 mg liter−1 δ-aminolevulinic acid, 3 µl of the induced culture were spotted on YESCA agar plates containing 30 µg mL−1 kanamycin, 34 µg mL−1 chloramphenicol and 0.01 mg mL−1 congo-red, and incubated at 20°C for 16 hr in the dark or under constant red light illumination (630 nm, 75 µW cm−2). As negative control we used a pETM-11 AppA construct (Winkler et al., 2013) that does not show any DGC activity. UV-Vis absorption spectra were acquired with a CCD-based Specord S300 Vis spectrophotometer (Analytic Jena, Jena, Germany) using protein samples equilibrated at 20°C and diluted in their corresponding storage buffers (Table 3 in Supplementary file 1). Dark-adapted Pr-state absorption spectra were measured under non-actinic conditions by minimizing the contact time with measuring light using a neutral density filter (ND = 1.0; Thorlabs, Newton, NJ) between the light source and the sample cuvette. Pfr-enriched spectra were recorded under constant red light irradiation (660 nm, 45 mW cm−2, Thorlabs) in the presence of the same neutral density filter for the measuring light. To record changes in Pfr/Pr ratio under various photon flux densities, the red LED (660 nm, Thorlabs) was adjusted to different light intensities at a distance of 60 cm from the sample. After establishing a steady-state at each light intensity, spectra were measured and absorbance values at 750 nm were extracted. Each light intensity measurement was acquired from the corresponding lower to the maximal intensity setting before allowing the sample to recover to its ground state and repeating the measurement in a technical triplicate. The sample standard deviation of individual measurements is used as error indicator in Figure 1d. Pr-state recovery kinetics were followed at 710 and 750 nm after 1 min red light illumination (660 nm, 45 mW cm−2, Thorlabs) using a Specord 200 Plus spectrophotometer (Analytic Jena) with 10 ms integration time sampled every 5 s and the recorded time constants differ by less than 10% between 700 and 750 nm measurements. To record the UV-Vis absorption spectra of the denatured biliverdin bound proteins, we followed the previously described method from Thümmler et al. (Thümmler et al., 1981). The concentrated protein sample was kept in the dark, or irradiated 1 min with saturating red light (660 nm, 45 mW cm−2, Thorlabs), before diluting it 1:10 in quenching buffer (0.1% trichloroacetic acid in methanol) to a final concentration of 1–2 μM. The absorption spectra of the denatured Pr- or Pfr-states were then directly recorded. Re-illumination of Pfr-peptides by red light triggers the isomerization of biliverdin back to the Pr-state and therefore Pfr-peptides were denatured directly after switching off the red light source and kept in the dark until their measurement. Fluorescence measurements were performed using an RF-5301 PC spectrofluorophotometer (Shimadzu, Kyoto, Japan) equipped with a concave blazed holographic grating excitation and emission monochromator, and containing a 150 W Xenon lamp (Ushio, Cypress, CA) as light source. Samples diluted to 2 μM were equilibrated at room temperature and complete darkness for the dark state measurement or 1 min under saturating red light (660 nm, 45 mW cm−2, Thorlabs) for the light state measurement prior to data acquisition. A sampling interval of 0.2 nm was used with a slit opening of 1.5 nm for the excitation slit and 5 nm for the emission slit. The IsPadCReg2 variant was crystallized at 293 K under dark conditions using a sitting-drop vapor diffusion setup. To obtain the best diffracting crystals, 2 µl drops containing equal volumes of protein solution at 5 mg ml−1 and reservoir solution (0.1 M magnesium formate, 12% (w/v) PEG 3,350), were seeded using the method of streak seeding and equilibrated against 35 µl of reservoir solution. Crystals appeared after overnight incubation and reached final dimensions within 10 days. Crystals were harvested under low intensity non-actinic green light conditions (520 ± 20 nm LED) by transferring the crystals to a cryprotectant solution (reservoir solution containing 30% glycerol) and subsequent flash-freezing in liquid nitrogen. Diffraction data for IsPadCReg2 were collected at beamline P11 of the Deutsches Elektronen-Synchrotron (DESY). Data were processed using the XDS program package (Kabsch, 2010) (Table 2 in Supplementary file 1). The crystal structure of IsPadCReg2 variant was solved by molecular replacement using PHENIX Phaser (McCoy et al., 2007) with the PAS-GAF fragment and the PHY-domain lacking the tongue extensions of the full-length structure of IsPadC (pdb 5LLW), as well as the DGC fragment of the IsPadC GTP soaked structure (pdb 5LLX). Two molecules for the PAS-GAF, PHY, and DGC search model were successfully placed in the asymmetric unit. The initial model of a PAS-GAF-PHY-GGDEF dimer was then manually extended to build the PHY-tongue and coiled-coil linker regions in several rounds of maximum-likelihood refinement of models modified with Coot using σA-weighted 2mFo – DFc and Fo – Fc electron density maps. In addition, torsion-NCS restraints and secondary structure restraints were included together with TLS groups for the individual domains of the protein. During the final rounds of refinement reference model restraints were applied on PAS-GAF-PHY excluding the PHY β-hairpin extension using a previously solved high resolution IsPadC PSM structure (Gourinchas et al., 2017), and on GGDEF domains using the IsPadC dark state structure (Gourinchas et al., 2017) and optimization of X-ray and ADP weights was performed. Spectral properties of the crystal were recorded at 100 K under a cryostream using a microspectrophotometer at the cryobench ID29S of the ESRF facilities (von Stetten et al., 2015). To record the conversion of GTP to c-di-GMP for all the variants, we adapted a protocol (Gourinchas et al., 2017) for high performance liquid chromatography (HPLC) from a previously described method (Enomoto et al., 2014). Briefly, purified protein samples were mixed with GTP at various concentrations in reaction buffer (50 mM Hepes pH7.0, 500 mM NaCl, and 50 mM MgCl2) at 20°C under non-actinic light for the dark state measurement, or under constant red light illumination (630 nm, 0.7 mW cm−2, Luminea LED) following a 1 min pre-illumination of the sample for the light state measurements. Samples were then thermally inactivated by 1 min incubation at 95°C. After separating the substrate and products from denatured protein by centrifugation, the nucleotides were separated by a linear 7 min gradient from 2% to 20% MeOH using a reversed phase HPLC column (SunFire C18 4.6 × 100; Waters, Milford, MA) equilibrated in 10 mM triethylammonium formate (pH 6.0). For protein variants isolated in a partially activated state and featuring a slow thermal recovery a prolonged incubation of the sample under far-red light (730 ±20 nm, Thorlabs LED) coupled to a far-red light bandpass filter (750 nm, Thorlabs) at room temperature and complete darkness was performed to fully populate the Pr-state of the sample prior to the dark state measurements. All kinetic data were normalized to the concentration of the dimeric protein, and all samples were corrected for the amount of c-di-GMP formed during the inactivation step. Deuterium labeling experiments were performed to address the effect of illumination on the conformational dynamics of IsPadCReg2 in order to compare it with the previously performed analysis of the IsPadC system (Gourinchas et al., 2017). Briefly, 200 µM protein sample were equilibrated at 20°C in the dark or under red light illumination (630 nm, 0.7 mW cm−2, Luminea LED) for 1 min prior to starting the deuterium-labelling reaction by diluting the sample 20-fold in D2O containing 10 mM Hepes (pD 7.0), 150 mM NaCl, and 10 mM MgCl2. Reactions were quenched with ice-cold 200 mM ammonium formic acid (pH 2.5) after 10 s, 45 s, 3 min, 15 min, and 60 min and injected into a cooled HPLC setup as described previously (Winkler et al., 2015). To sum up, deuterated samples were digested on an immobilized pepsin column (Poroszyme; Applied Biosystems, Foster City, CA) operated at 10°C. Resulting peptides were desalted on a 2 cm C18 guard column (Discovery Bio C18, Sigma), and separated during a 7 min acetonitrile gradient (15–50%) in the presence of 0.6% (v/v) formic acid on a reversed phase column (XR ODS 75 x 3 mm, 2.2 µM, Shimadzu). Peptides were then infused into a maXis electrospray ionization-ultra high resolution-time-of-flight mass spectrometer (Bruker, Billerica, MA). Deuterium incorporation was analyzed and quantified using the Hexicon 2 software package (http://hx2.mpimf-heidelberg.mpg.de) (Lindner et al., 2014). Journal of Biological Chemistry 288:35714–35725. Journal of Biological Chemistry 289:25590–25600. Applied Microbiology and Biotechnology 85:1095–1104. Journal of Biological Chemistry 287:7000–7009. Journal of Biological Chemistry 280:34358–34364. The Plant Cell Online 26:4568–4583. The European Physical Journal Plus 131:56. Journal of Experimental Botany 49:127–138. The Plant Cell Online 21:786–799. Plant, Cell and Environment 20:713–721. Journal of Molecular Biology 393:619–633. Journal of Biological Chemistry 289:24801–24809. Journal of Biological Chemistry 293:9078–9089. Current Opinion in Plant Biology 33:1–7. Journal of Biological Chemistry 276:7913–7918. Nature Reviews Molecular Cell Biology 2:11. Nature Reviews Molecular Cell Biology 9:860. Journal of Molecular Biology 429:1336–1351. Journal of the American Society for Mass Spectrometry 25:1018–1028. Molecular phylogenetics and evolution 49:411–423. Accounts of Chemical Research 40:258–266. Microbiology and Molecular Biology Reviews 77:1–52. Journal of Biological Chemistry 288:16800–16814. Journal of Molecular Biology 428:3683–3701. Annual Review of Biochemistry 84:519–550. The Journal of Physical Chemistry Letters 5:2512–2515. Journal of Biological Chemistry 290:16383–16392. Journal of Biological Chemistry 281:34751–34758. Zeitschrift Für Naturforschung C 36:440–449. Nature Reviews Molecular Cell Biology 15:551–558. Acta Crystallographica Section D Biological Crystallography 71:15–26. Journal of Biological Chemistry 282:12298–12309. Journal of Biological Chemistry 283:12212–12226. Nature Structural & Molecular Biology 20:859–867. Journal of Biological Chemistry 288:31738–31751. Thank you for submitting your article "Asymmetric activation mechanism of a homodimeric red light regulated photoreceptor" for consideration by eLife. Your article has been reviewed by three peer reviewers, and the evaluation has been overseen by a Reviewing Editor and Michael Marletta as the Senior Editor. The following individuals involved in review of your submission have agreed to reveal their identity: Katrina T. Forest (Reviewer #2). 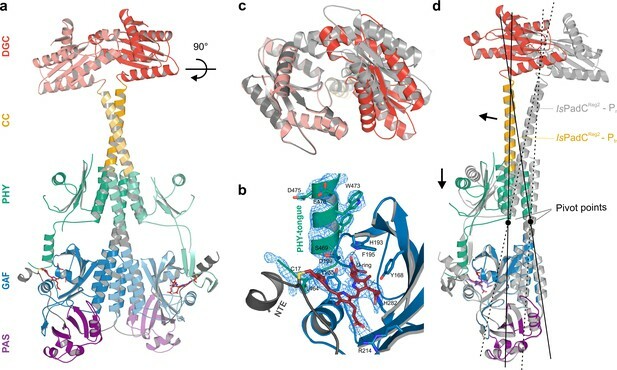 The manuscript by Gourinchas, Heintz and Winkler addresses the mechanistic role of structural asymmetry in allosteric activation of modular signaling proteins. Specifically, the authors examined the light signaling mechanism in a full-length photo-activated diguanylyl cyclase, IsPadC. They reported the crystal structure of an activated IsPadC variant (IsPadCReg2). 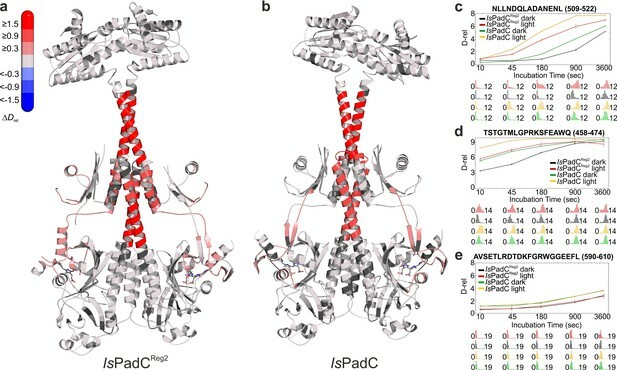 By comparing the IsPadCreg2 structure with the inactive wild type IsPadC structure from their previous work, they propose that light-induced structural asymmetry represents a critical event in IsPadC activation. Apparently, the output module can be de-coupled from the photosensing module and remain either inactive or active, and one half of the molecule can be structurally Pr, while the other half is structurally Pfr. Relatively local changes in the dimer interface are seen relative to the native structure, supporting the conclusion that there are not any major conformational changes upon activation but rather subtle rearrangements at interfaces. HDX experiments are also presented and provide a complete comparison to the native protein results presented previously. These results support the model presented and confirm the overall structure of Reg2 behaves very similarly to the native protein in terms of accessibility changes before and after illumination. While the topic and findings of this work are interesting, several major issues must be addressed or clarified before its final publication. All three reviewers were in agreement about the major strengths and weaknesses of the paper, and this decision letter uses wording from each of the reviews and the discussion in an attempt to summarize the reviewers' comments. 1) The most significant concern of all reviewers and the major point of our discussion is the inconclusive interpretation of the spectroscopic data regarding structural asymmetry at the chromophore site. The spectroscopic arguments lack validity because there are too many equally valid alternatives, including the possibility of apo protein and/or misfolded protein within the sample. It is not clear if the authors mean the Pfr/Prheterodimer or Pfr/meta-R heterodimer represents the functional dimer for IsPadC. It is important to distinguish between the signaling state of the protein structure and the signaling state of the chromophore, because the protein tertiary structure may or may not correspond to a specific chromophore conformation in photoreceptors. Very often, they are decoupled in asymmetric dimers such as IsPadC or in crystals due to lattice constraints. The authors should both provide more detailed information (see below) and tone down interpretations about 50%/50% Z/E conformation in the activated Reg2 protein. The following should be included: a) Pr-Pfr difference spectra for Reg2 in solution. b) More careful presentation of Pfr to Pr thermal reversion data. It appears from the Materials and methods section that this reaction was measured at 700 and 750 nm, but Supplementary file 1 indicates in the legend and the table that it was measured at 710 nm. Thermal reversion could be used in a more systematic way to address the possibility of a non-Pfrphotoproduct. The authors noted that three exponentials are required to explain Pr accumulation. Are there three exponentials for Pfr depletion? If so, do the time constants of these exponentials match? And, if so, are the ratios of the amplitudes at 750 nm to those at 700 nm similar for each time constant? If this is the case, the authors may just be looking at three manifestations of Pfr to Pr thermal reversion (e.g., Pfr/Pfr to Pfr/Pr, Pfr/Pr to Pr/Pr, thermal reversion from misfolded species, etc.). If not, the authors may have a non-Pfrphotoproduct (e.g., if only two exponentials are required for fitting of Pfr depletion, or if the 750 nm:700 nm amplitude ratio corresponding to one time constant differs greatly from the other two). c) Simulated annealing omit-maps for LBV in subunit A and B as well as superposition of the bilin chromophores between subunit A and B in both the WT (inactive; symmetric) and Reg2 (activated; asymmetric) structure. d) Superposition of the LBV chromophores from subunits A and B based on the structural alignment of the protein framework. e) Simulated annealing omit-maps of the PHY-tongue in subunit A and B. The crystal spectra are confusing rather than informative (Figure 1C). The authors appear to normalize spectra at the Pr state of the Q band of the crystalline and RL solution samples. However, proteins are structurally ordered within crystals, and random in a solution. Absorption spectra for a crystal will then be a function of the angle through which light passes. This issue is seen most clearly for the Soret peak, which is actually higher in magnitude than the Q band, this issue could also affect the relative extinction coefficients of the Q band of Pr and Pfr, because the D-ring flips and the bilin moves within the binding pocket. The way to get around this would be to collect 180 degrees of absorption data for a single crystal and take a weighted average (weighted against the pathlength through the crystal), or more easily, collect spectra from several randomly oriented crystals in a cuvette. Although there is an advantage in the same crystal form for WT and Reg2 (it implies this asymmetry can't be forced by the crystal packing), it is also possible that further conformational changes are inhibited by the crystal packing. If this asymmetric state is active, then the crystalline protein should be active. Whereas, if further protein changes are needed to get to a Pfr/Pfr state for full activity, and if that is prohibited by crystal packing, the crystalline protein will be inactive. Unfortunately testing activity of crystals is tricky due to the possibility of soluble protein in equilibrium with crystalline. Thus, this assay is not a requirement of a revision, but it might be worth trying. One suggestion for improved presentation of this point is that the authors should use superposition between subunit A and B (aligned according to PAS-GAF-PHY), rather than superposition between the WT and Reg2 structures (as shown in Figure 2 and Figure 3—figure supplement 3), to demonstrate structural asymmetry. The conformational change that moves the linker coiled-coil into its second active register is described throughout the paper as a translation. This is not entirely accurate, as a true translation would mean that every atom has moved by the same x, y, z vector. Could "pivot" or "hinge" be used in the text, as it is in Figure 2D? This would more accurately describe motions which lead to larger translations of the atoms further from the pivot point than those close to it. (Examples in subsection “Detailed comparison of the active and inactive IsPadC crystal structures” and subsection “DGC activity is regulated by structural rearrangements and changes in conformational dynamics”). It is a bit surprising and unacceptable that the authors did not compare any (asymmetric) structure features at the active site of DGC given the full-length WT and Reg2 structures. Ultimately, asymmetry in the tertiary/quaternary structure must serve the active site of DGC, in which the catalytic residues from each subunit are positioned to perform different (thus asymmetric) functional roles. In particular, direct comparison between the full-length crystal structures of WT and Reg2 is expected to reveal structural (re-)arrangements at the catalytic site of DGC. In the absence of structural data and discussion on asymmetry at the active site of DGC, the significance and contribution of the full-length structure is significantly diminished. It is entirely possible that the catalytic site configuration in the crystal structure does not correspond to the signaling state of PSM. In other words, the effector domain is decoupled from the PAS-GAF-PHY domains, either due to the crystal packing effect or mutations in the linker helices. Regardless of the configuration of the DGC active site (presumably located at the dimer interface), the authors should take advantage of their full-length structures of WT and Reg2 with detailed descriptions and structural comparisons between the WT and Reg2 structures in the effector domains, in particular the active site. The entire Introduction is written as a single paragraph and is consequently pretty clunky. Also, the fusion of Results section and Discussion section causes confusion because the experimental data, structural interpretation, hypotheses, speculation and reasoning are not clearly distinguished in the text. Results section and Discussion section should be separated. 1) The most significant concern of all reviewers and the major point of our discussion is the inconclusive interpretation of the spectroscopic data regarding structural asymmetry at the chromophore site. The spectroscopic arguments lack validity because there are too many equally valid alternatives, including the possibility of apo protein and/or misfolded protein within the sample. After repeating some experiments and including additional controls, we are now in a position where we do understand in more detail what appears to be happening on a molecular level. Therefore, we agree that the initial spectroscopic characterization presented was superficial and to some extent not interpreted with the required care. We have now reanalyzed the data and provided additional figures/panels (Figure 1, Figure 1—figure supplement 2 and Figure 1—figure supplement 3) to enrich the presentation of the thermal recoveries in Supplementary file 1. Plotting the recoveries as A750/A710 ratios vs. time showed that extremely slow recovery contributions are present in IsPadCReg1 and IsPadCReg2.a. Including fixed, known endpoints (based on the initial dark state spectrum) for the fitting routine provided a much more robust observation of time constants and relative amplitudes of the various contributing species. In fact, this revealed that all analyzed IsPadC constructs (starting from almost identical steady-state light-activated spectra) feature a fast recovering contribution with constant relative amplitude of roughly 36% at 750 nm. In combination with the observation that the recoveries proceed with a subtle non-isosbestic behavior (Figure 1—figure supplement 2E), this indicates a molecular species featuring a lower extinction coefficient at 750 nm with overlapping spectral properties to the Pr and Pfr states as being responsible for the fast recovery contribution. Further supporting our initial hypothesis of meta-R like states in combination with Pfr contributions being responsible for the steady-state light activated IsPadC spectrum, these spectral characteristics have been combined with references to previously published studies describing spectral properties of meta-R states (e.g. Borucki et al., 2005; subsection “Individual protomers of dimeric IsPadC feature different biliverdin environments upon illumination”). While we agree that other factors could also be responsible for the observed behavior, we think that the observations of asymmetry along several additional lines of evidence support our conclusion of an asymmetric heterodimer upon light activation. Especially the spectral characterization of the IsPadCReg2.a variant, with an extremely stable Pfr contribution, indicates that the stabilization of the coiled-coil in register 2 greatly enhances Pfr lifetime without affecting the amplitude of the fast recovering meta-R species. If the steady-state spectrum was obtained by mixed biliverdin populations in both cofactor pockets of the dimer or apo-protomer containing dimers, then such a pronounced stabilization of Pfr should result in an increased Pfr population in the steady-state, which is not the case. The initial characterization of spectral properties during red light illumination clearly reveals a complex system involving multiple molecular species that are difficult to ultimately confirm with the methods used in this manuscript. More sophisticated experiments aiming at improving the time resolution and addressing vibrational modes of the biliverdin cofactor have been initiated in collaborative efforts and will help to address spectroscopic properties in more detail. Especially since no fast spectroscopy data are available for the IsPadC system, we refrained from a direct assignment of the meta-R state (meta-Ra or meta-Rc) but based on the structural implications we think that an early meta-R state where no tongue rearrangement has taken place is the most likely candidate to be stabilized in the asymmetric IsPadC heterodimer. It is not clear if the authors mean the Pfr/Prheterodimer or Pfr/Meta-R heterodimer represents the functional dimer for IsPadC. It is important to distinguish between the signaling state of the protein structure and the signaling state of the chromophore, because the protein tertiary structure may or may not correspond to a specific chromophore conformation in photoreceptors. Very often, they are decoupled in asymmetric dimers such as IsPadC or in crystals due to lattice constraints. We apologize for not being consistent enough with our description of conformational states describing the biliverdin environment, the PSM rearrangements, the coiled-coil register, or overall structural changes. Since this is complicated by the fact that some uncoupling of the structural rearrangements is always possible a clearer description of what is meant at which stage of the Results section and Discussion section is of course very important. We have tried to meet this requirement throughout the revised version, but have to admit that, considering the dynamic contribution of all functionally important elements, this can sometimes be difficult or even ambiguous. To reduce the ambiguity with respect to photoactivation, active register and enzyme activity, we have changed the nomenclature of the coiled-coil registers from inactive and active to inhibiting and stimulating, respectively. With respect to the Pfr/Pr vs. Pfr/meta-R differentiation, we think that the global structural implications will be quite similar. Considering that early meta-R states are characterized by an isomerized biliverdin cofactor where only side chain rearrangements close to the biliverdin are realized without fully proceeding to the true Pfr state (i.e. including tongue refolding), we believe that the Pfr/Prheterodimer crystal structure (obtained in the dark) globally reflects the structure of the Pfr/meta-R heterodimers that are present during illumination with saturating red light. After switching off the light the meta-R component converts back to Pr relatively quickly and the resulting Pfr/Prheterodimer would still be expected to be more active than a Pr/Prhomodimer in the wild-type. In terms of the nomenclature used by the reviewers both forms are therefore “functional dimers” of the IsPadC system. If the remark referred to “the active” dimer, we have to say that there is not only a single conformation that is active. Due to the partial uncoupling of different functional elements in the PSM, the coiled-coil and also the DGC the global dynamic interplay influences the enzymatic activity and, similar to many other photoreceptors, IsPadC is clearly not an on/off switch. As far as lattice restraints are concerned, of course they can play a role for trapping non-functional states and could therefore bias our conclusions; however, in our case the crystal lattices are almost identical between the Pr/Pr homodimer in the wild-type structure and the Pfr/Prheterodimer in IsPadCReg2. We believe that the driving force for the observed structural rearrangements is due to the population of register 2 even in solution (as indicated by HDX-MS). This register conformation stabilizes the Pfr state as also shown by the thermal recoveries (Supplementary file 1) and even in solution there appears to be an equilibrium of Pfr and Pr states – eventually the heterodimeric species crystallizes in the case of IsPadCReg2. However, the fact that the Prhomodimer is still more stable in solution than a Pfr/Pr mix, indicates that indeed there might be some uncoupling between the linker and the biliverdin environment; the coiled-coil can exist in register 2 at the same time as both protomers biliverdin environments are in Pr. We also cannot rule out some switching of the coiled-coil back to register 1 even in this variant, which most likely would also be partially uncoupled from the tongue and biliverdin environments. Clearly the signal transduction pathways in phytochromes do not follow the domino principle but more the violin model of allosteric regulation referred to also in our initial IsPadC publication (Gourinchas et al., 2017). The authors should both provide more detailed information (see below) and tone down interpretations about 50%/50% Z/E conformation in the activated Reg2 protein. As stated above, we have rephrased many passages where a direct reference to an activated species and a specific structural conformation is mentioned. Clearly there is no strict requirement for a 50/50 E/Z ratio for optimal activity and this is definitely not what we intended to say. Under high light conditions the E conformation will be strongly enriched and the resulting Pfr/meta-R species (E/E) are highly active. However, under some circumstances an E/Zheterodimer will also exist and can be fully active considering the coupling of chromophore and coiled-coil environments. For example, under low light conditions – or even single photon excitation – the Pfr/Pr species will dominate the equilibrium of species in solution. Also, after switching off the light the meta-R species recovers more quickly than Pfr and we again have a Pfr/Pr enrichment. In both cases E/Z ratios of individual (activated) dimers will be close to 50% and dependent on the degree of coupling between the conformational states in functionally important elements. The population average might of course differ from that and due to the thermal recoveries also change in a time dependent manner. If this comment was meant to refer only to the crystal structure, then I hope that the new data included (comparison of crystal spectra and OMIT maps – Figure 2—figure supplement 1, Figure 2—figure supplement 2 and Figure 2—figure supplement 3) further support the refined model of the IsPadCReg2heterodimer with a 50% E/Z ratio. In order to be consistent for all the variants described in the manuscript we included difference spectra of light–dark (which appears to be the more prevalent type of phytochrome difference spectra in the literature) for IsPadC, IsPadCReg1, IsPadCReg2, IsPadCReg2.a and the tongue deletion variant (IsPadCD442-477::SG). These spectra are now included in the new Figure 1—figure supplement 2 and Figure 1—figure supplement 3. Figure 1—figure supplement 2F shows a direct comparison of the individual difference spectra. The thermal reversion data have been measured at the maximum of the Pr Q-band absorption of wild-type (710 nm) and the maximum of the Pfr (+ early meta-R) contribution in the light-dark difference spectrum of IsPadC (750 nm). We apologize for the typo in the Materials and methods section. The time constants of individual exponential contributions match very well between 710 and 750 nm data. In addition to the time constants, also the amplitude contributions at the two wavelengths appear very similar. Detailed analysis of all phases resulted in amplitude@750/amplitude@710 ratios of: IsPadCt1 – 0.69, t2 – 0.62; IsPadCReg1 t1 – 0.53, t2 – 0.75, t3 – 0.83; IsPadCReg2 t1 – 0.64, t2 – 0.72; IsPadCReg2.a t1 – 0.66, t2 – 0.66, t3 – 0.7. Combining these data results in an average amplitude@750 over amplitude@710 ratio of 0.68, with a sample standard deviation of 0.08 for the 10 phases reported in Supplementary file 1. Along the lines of argumentation of the reviewers these observations would suggest different manifestations of Pfr to Pr recovery. In the case where two exponentials are sufficient to describe the data, the fact that the amplitude contributions are not 50%, however, suggests that the colored species of the steady-state light activated spectrum have different spectral contributions. Therefore, the most likely explanation in our opinion is the inclusion of an early meta-R species that has a lower extinction coefficient as Pfr. The amplitude contributions of meta-R and Pfr species match very well with data provided for the corresponding states in Agp1 phytochrome (Borucki et al., 2005). Considering also the different isosbestic points of meta-R and Pfr with the Pr state, the observed non-isosbestic behavior (Figure 1—figure supplement 2E) matches the postulated behavior for a fast meta-R recovering species and a slower Pfr recovery. Looking more closely at the amplitude contributions in the range of the isosbestic points also revealed a strong dependence of relative amplitudes on the wavelength of the fit (cf. Author response image 1). Therefore, the similar amplitude contributions observed at 710 and 750 nm are merely a coincidence and do not indicate that our observations refer to different manifestations of Pfr recoveries. But why do we need three exponentials for some constructs and only two to adequately fit the data for other constructs? This is a complex question and we do not have a conclusive answer to that; however, since the number of exponentials needed to describe the recoveries depends on salt and protein concentration, one potential answer would be that the more stable registers 1 and 2.a variants have different in solution properties than the other tested variants at the same protein concentration – e.g. tendency for unspecific oligomerization. Another explanation could be that the restriction of conformational dynamics in the coiled-coil linker affects the biliverdin environments of the two protomers differently. IsPadCReg2.a would favor the Pfr state on the structurally predestined protomer and only a small partially uncoupled subpopulation could form Pfr on the other protomer. Due to the restrained dynamics of the overall system the two different Pfr–coiled-coil substructures would show different recoveries, which is why the total Pfr recovery contribution is split up into two different phases. We performed OMIT map calculations using a recently described, improved version of OMIT map generation that handles issues with bulk-solvent models more adequately. Details can be found in Acta Crystallogr D Struct Biol. 2017 Feb 1;73(Pt 2):148-157 doi: 10.1107/S2059798316018210. While similar to simulated annealing OMIT maps calculated by a classical approach, the slightly improved quality of the “polder maps” enable easier visualization of features of interest. The LBV maps for both protomers in the asymmetric unit are shown in Figure 2—figure supplement 2 for both the IsPadCReg2 structure (panel a and b) and wild-type IsPadC data (panel c and d). While the two biliverdin conformations of the wild-type structure are virtually identical, the two LBV models of the register 2 variant differ significantly. To illustrate the differences, the refined models of each protomer are overlaid with the model of the corresponding other protomer in the colors used in previous figures; i.e. dark-red for the biliverdin cofactor of the Pfrprotomer A and light-red for the Prprotomer. We refrained from including the analogous superposition for the wild-type panels since it causes confusion due to the almost identical conformations in both protomers. However, panels e and f of Figure 2—figure supplement 2 show the biliverdin cofactors of both protomers based on the alignment of the PAS-GAF cores in the context of neighboring residues. The superposition of the biliverdin cofactors mentioned above was calculated using the PAS-GAF bidomain for the structural alignment; we apologize if we have not correctly interpreted the lines in comments c and d, but we think that one superposition of the LBV cofactors is sufficient. To better appreciate the consequences of D-ring rotation in the near surrounding of the biliverdin, we have included panels e and f in Figure 2—figure supplement 2. They have been included in Figure 2—figure supplement 1, using the same “polder maps” described in our response to comment c. While it is difficult to find suitable views that satisfy the reader in every aspect of both tongue conformations, we hope that the illustration chosen helps to appreciate the pronounced differences in tongue architectures. We believe that the interested reader will download the coordinates along with the deposited structure factors. The intention of this figure was to illustrate that there are spectral similarities between the IsPadCReg2 crystals and the in solution properties upon illumination of all IsPadC constructs. The normalization to the Q band of in solution data, used to bring them on similar scales, was probably pushing the limits of acceptable data treatments too far; we apologize for that. We now decided to strictly separate crystal spectra from in solution spectra and have therefore moved the crystal spectrum to Figure 2—figure supplement 3. To partially account for the extinction coefficient variation at different orientations of the crystal, we averaged 20 different snapshots at different orientations (knowing that they might be biased to suitable orientations of the plate like crystals in the loop relative to the incident light beam) acquired at cryogenic temperature. This is then compared to cryogenic data of Pr/Prhomodimer wild-type IsPadC crystals (4 different orientations available). These two datasets were normalized to the region where light and dark-state spectra intersect in solution (strictly speaking no isosbestic point is available, but for a direct comparison this is the best normalization approach that we could think of). In this illustration, it is obvious that IsPadCReg2 crystals have a pronounced 750 nm contribution and that wild-type vs IsPadCReg2 crystal spectra mimic the dark vs light spectra in solution, with the only exception that the Q band features are more defined at the cryogenic temperature measurements. Of course, it was not our intention to say that the crystal spectrum is identical to the in solution spectrum of light activated IsPadC. Crystals clearly feature a mix of Pfr/Pr species whereas in solution and at saturating red light conditions we expect Pfr/meta-R heterodimers. We have not performed any activity assays with isolated IsPadC or IsPadCReg2 crystals. The reason for this relates to the caveats mentioned by the reviewers, but also the fact that the GGDEF mechanism is a lot more complex than substrate conversion at a defined active center. The DGC active site is formed at the interface of both subunits and requires concerted structural rearrangements of both subunits for appropriately positioning the two GTP molecules for initial bond formation (pppGpG intermediate), subsequent second bond formation (c-di-GMP), product and sideproduct(s) (PPi) dissociation, followed by binding of new GTP molecules. Considering the dynamic nature of the GGDEF interface and the reduced degrees of freedom in the crystal lattice, we would not expect that substantial turnover can happen in the crystals. However, we tried soaking of IsPadCReg2 crystals with GTP to see if we could obtain indications of initial steps of substrate conversion in the crystals. However, the crystals start cracking and partially disintegrate resulting in rather lousy diffraction data (worse than 4 Å). This could result in increased populations of soluble protein in equilibrium with the crystals and any activity data inferred from such measurements should not be correlated with the activity of the crystals. Interestingly, the same soaking procedure with the wild-type protein crystals did not result in cracking and a refined dataset has been included in our previous IsPadC publication (pdb 5LLX). This difference points at an increased structural flexibility of the IsPadCReg2 system that might be correlated with structural arrangements that are not possible in the structure of the wild-type protein. In our opinion, the GTP induced structural changes, resulting in cracking of the crystals, are indicative of subsequent catalytic steps following GTP binding that are not feasible in the inhibiting register 1 conformation of the coiled-coil. Even though no full catalytic cycle is compatible with the lattice restraints, the fact that coiled-coil switching is coupled to Pfr formation on one protomer suggests that the observed Pfr/Pr assembly is one functionally important state involved in DGC activity regulation. Whether the GGDEF conformations are fully coupled or partially uncoupled from the PSM-coiled-coil rearrangements in the crystal lattice is a different question. We tried to clarify these points in the Results section and Discussion section. We fully agree that Figure 2 should focus only on the new IsPadCReg2 data. Even though we mentioned that the PAS-GAF-PHY domains of the Pr conformation in the IsPadCReg2 crystal structure are virtually identical to the wild-type Pr conformation, we have now replaced the corresponding grey cartoon representation in panel D of Figure 2. Due to the similarities of the Pr states, the new figure appears to only have a changed label compared to the original one. In terms of the superposition algorithm we refrained from using PAS-GAF-PHY, because in fact the PHY domain rearrangements relative to the PAS-GAF bidomain are one of the important things to show at this point (the PAS-GAF dimer remains virtually unaffected by Pfr state formation). That the PHY dimer rearrangement is eventually also translated into an asymmetric GGDEF interface is reflected in panel c, where we now also only show IsPadCReg2 data and aligned the GGDEF protomer of chain A to that of chain B. Since this no longer corresponds to the structural rearrangement induced by the coiled-coil transition, we have included an enriched version of the original comparison to the wild-type DGC interface in Figure 3—figure supplement 2. In the latter figure, we also kept the structural alignments between the wt / IsPadCReg2 / IsPadC + GTP structures to highlight the differences in linker architectures induced by Pfr formation and GTP binding. We admit that the term translation is only an approximation and only valid for the structural changes in the center of the coiled-coil region. The C-terminal PHY helix features a more pronounced hinge-like movement and also the C-terminal part of the coiled-coil follows a more complex structural reorganization to satisfy supercoiling of the two helices (strictly speaking, a pure hinge like movement in a coiled-coil would destroy the knobs into holes packing of this structural entity). In order to account for these complex structural rearrangements, we have now clearly stated in the Results section that the translational component in the coiled-coil is part of a hinge-like global structural rearrangement (subsection “The crystal structure of IsPadCReg2 features an asymmetric Pfr/Pr heterodimer”). In fact, the hinge-like movement of the PHY-coiled-coil is coupled to the hinge movement of the PSM. The fact that the estimated pivot points do not overlap shows that even description as a hinge rearrangement is only an approximation in a complex three-dimensional system. Therefore, we decided to use the term “quasi-translational” movement of the coiled-coil throughout the manuscript. This terminology allows clear differentiation from the more commonly assumed rotational coiled-coil transitions and still indicates that the situation is more complex than a pure translation. That “translation” is indeed a good approximation is also shown in a close up of the central coiled-coil linker part in Figure 3—figure supplement 1b. We initially kept the discussion of mechanistic aspects of the DGC to a minimum because we wanted to focus the manuscript on the asymmetric activation mechanism of the phytochrome module. Our assumption was that including the complex DGC mechanism description in the manuscript would distract the reader from the major findings in the phytochrome part. Especially since it is known that DGCs can crystallize in many (also unspecific) dimer interfaces, we are aware that any conclusions drawn from this specific crystallographic snapshot need to be considered with caution. Nevertheless, we have now included a basic discussion of the observed structural rearrangements and their potential implications for mechanistic aspects of GTP to c-di-GMP conversion (subsection “The crystal structure of IsPadCReg2 features an asymmetric Pfr/Pr heterodimer”). As far as asymmetric functional roles are concerned (as stated in the reviewers comment), we want to point out that asymmetry is likely important for the first bond formation step, but that in the second step of c-di-GMP formation a symmetric active site could also be envisaged (cf. pdb 3TVK with symmetry mate). Such multi-step pathways are difficult to rationalize with one crystallographic snapshot in the absence of substrate and therefore we tried not to overinterpret our findings in the corresponding parts of the Results section and Discussion section. As stated in our previous reply, we have included additional descriptions and comparisons between DGC conformations of WT and Reg2 in the revised version of the manuscript. We also clearly stated that the observed DGC arrangement has interesting implications for the catalytic mechanism but pointed out that the interpretation is complicated by the complex reaction mechanism and the fact that multiple rearrangements are expected to be involved in the turnover of GTP to c-di-GMP. This concept also shows that the dimeric DGC assembly cannot be strictly coupled to the coiled-coil conformation. Some uncoupling from the coiled-coil register conformation and ultimately the signaling state of the PSM is required to perform its function. An almost complete uncoupling from the PSM is nicely demonstrated by the IsPadCReg1 and IsPadCReg2.a variants, which still show PSM photoactivation but no effect of light on the catalytic activity. In both variants the coiled-coil conformation is the activity determining parameter. The degree to which the PSM can influence the coiled-coil register and the degree to which this register is coupled to the DGC dynamics ultimately affect the dynamic range of the system. We apologize for the lack of structure in our initial version and have introduced new paragraphs at appropriate positions throughout the manuscript. We also separated Results section and Discussion section, but kept the Discussion section very similar to the previous version. We removed redundant passages and pure results wherever possible but are aware that this was not possible for all aspects of the new Discussion section. We think that a certain degree of redundancy will help the reader to follow the main conclusions and believe that the overall readability has greatly improved from restructuring the initial manuscript. We thank E Zenzmaier for technical support and U Vide for cloning, expressing and purifying the IsPadCΔ442-477::SG variant. We are grateful to I Schlichting for continuous support. We thank R Lindner for input during the HDX-MS measurements and during data analysis with the Hexicon two software package. We are grateful to K Gruber for providing access to the crystallization facilities at the Institute of Molecular Biosciences at the University of Graz. We appreciate the efforts of the Strubi-Graz beamline teams that are supported by BAG proposals MX-526 and MX-1939 at various beamlines. Parts of this research were carried out at PETRA III at DESY (Burkhardt et al., 2016), a member of the Helmholtz Association (HGF). We would like to thank A Burkhardt for assistance in using beamline P11. We are also grateful to the support of the ESRF staff at the cryobench facility ID29-S (von Stetten et al., 2015), specifically A Royant and G Gotthard. The authors also acknowledge the platforms of the Grenoble Instruct center (ISBG; UMS 3518 CNRS-CEA-UJF- EMBL) supported by the French Infrastructure for Integrated Structural Biology Initiative FRISBI (ANR-10-INSB-05–02) and GRAL (ANR-10-LABX-49–01) within the Grenoble Partnership for Structural Biology (PSB). Atomic coordinates and structure factors for the reported crystal structure have been deposited with the Protein Data Bank under accession number 6ET7. GG. is supported by the by the Austrian Science Fund through the PhD programme ‘DK Molecular Enzymology’ (W901). The authors gratefully acknowledge support from NAWI Graz. AW. acknowledges funding by the Austrian Science Fund (FWF): P27124. © 2018, Gourinchas et al.